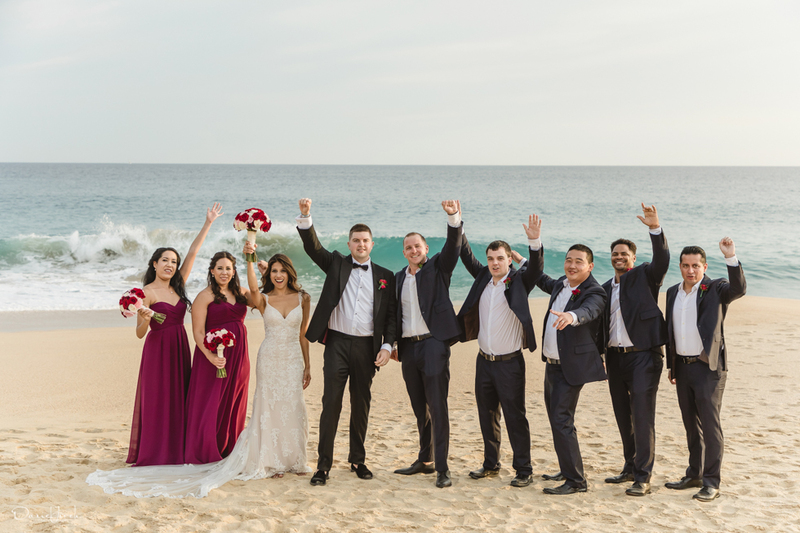 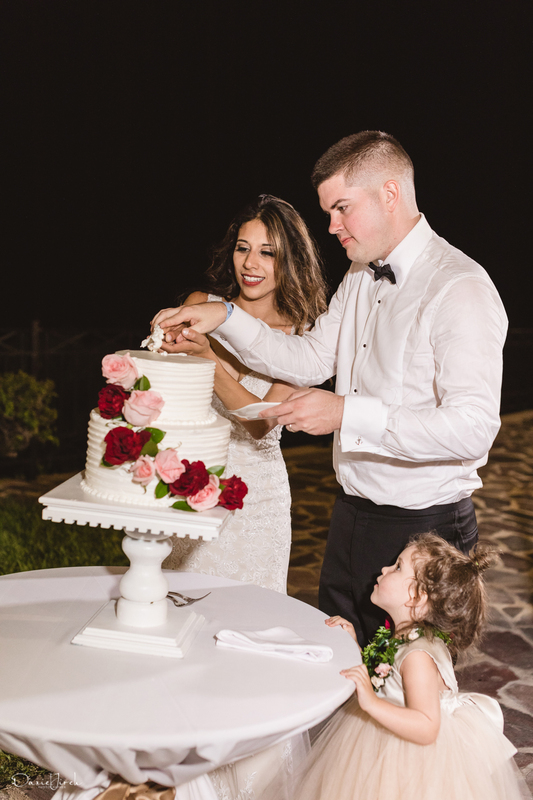 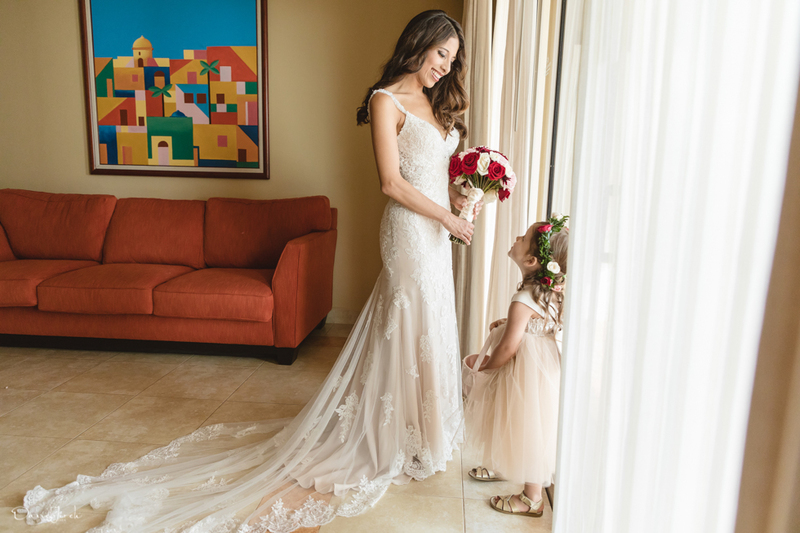 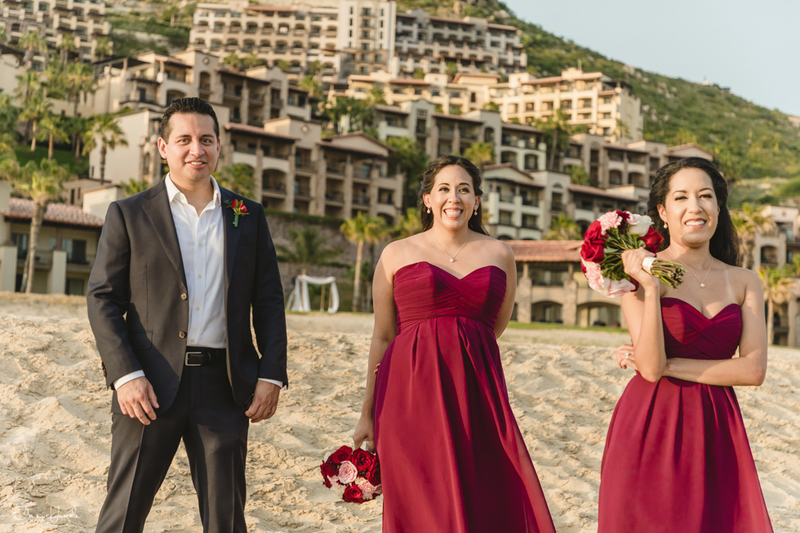 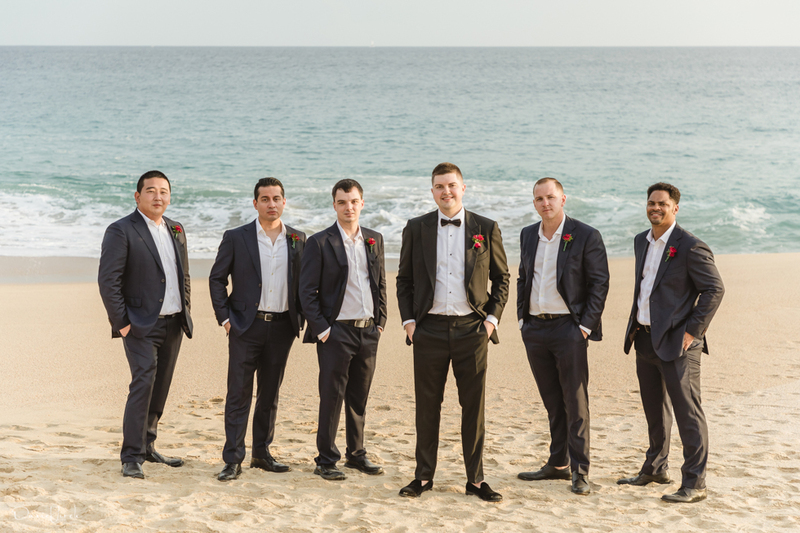 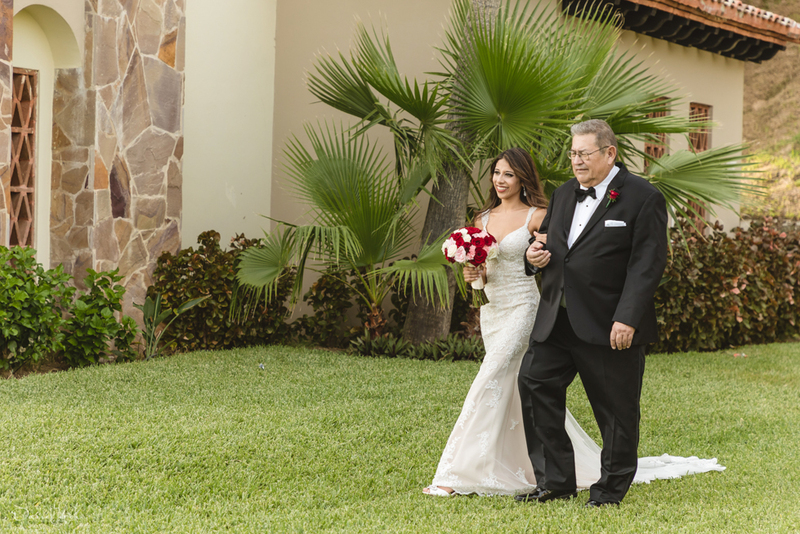 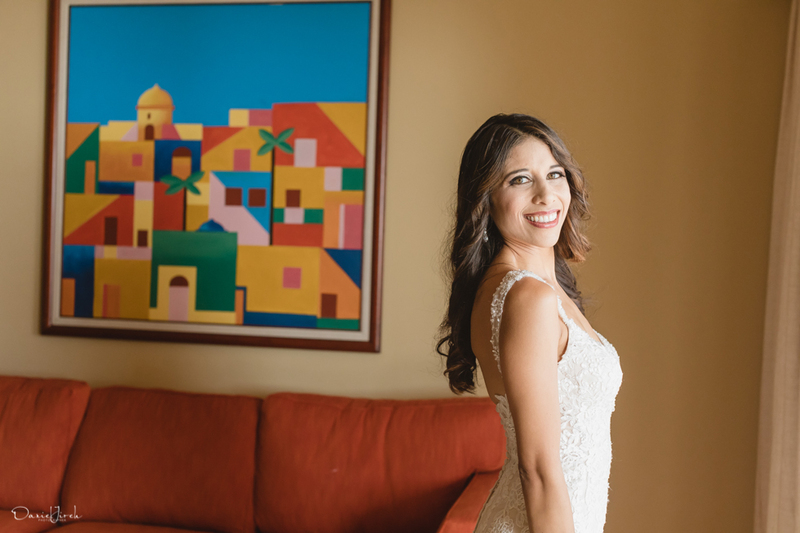 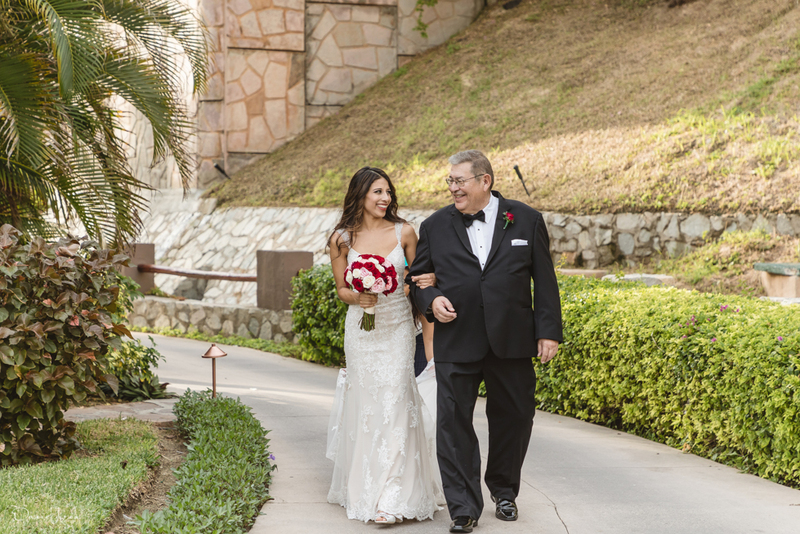 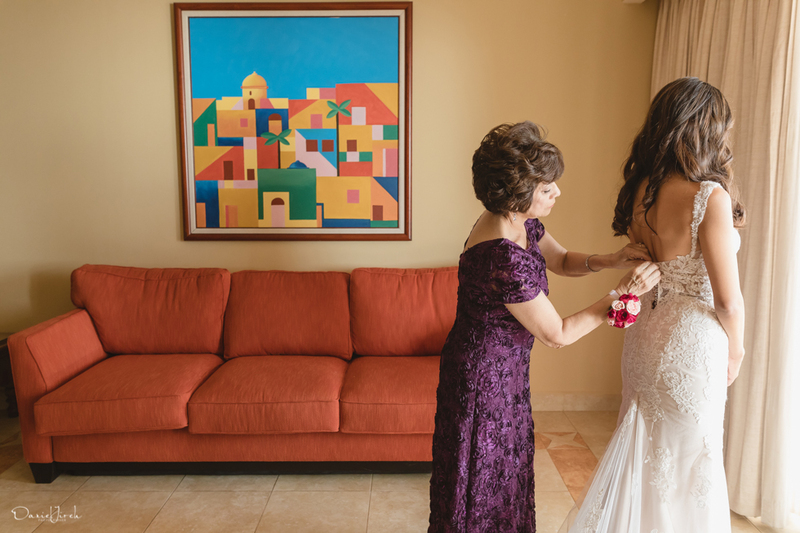 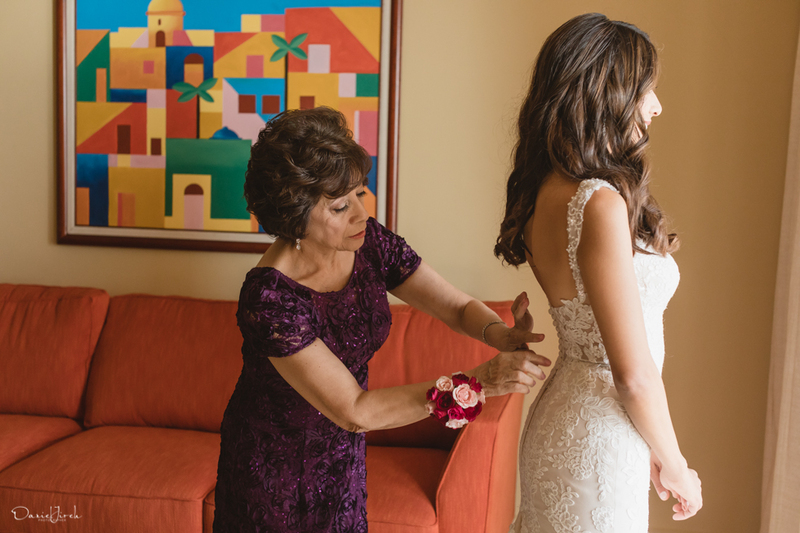 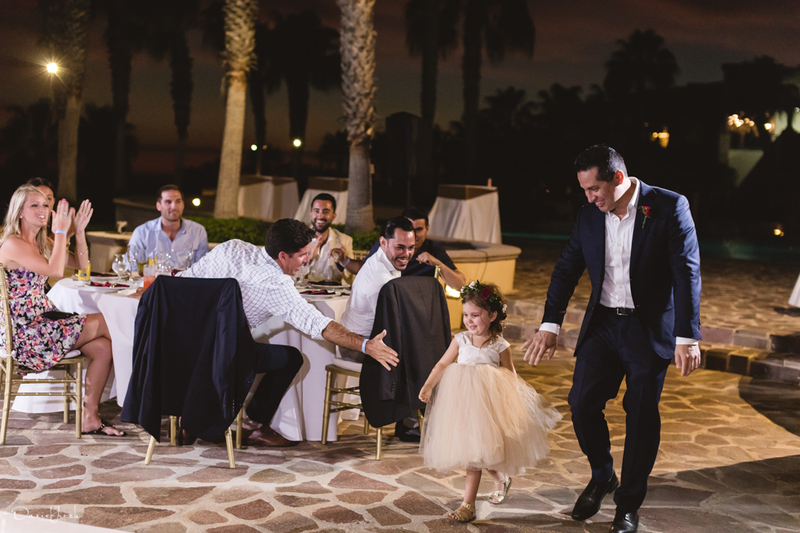 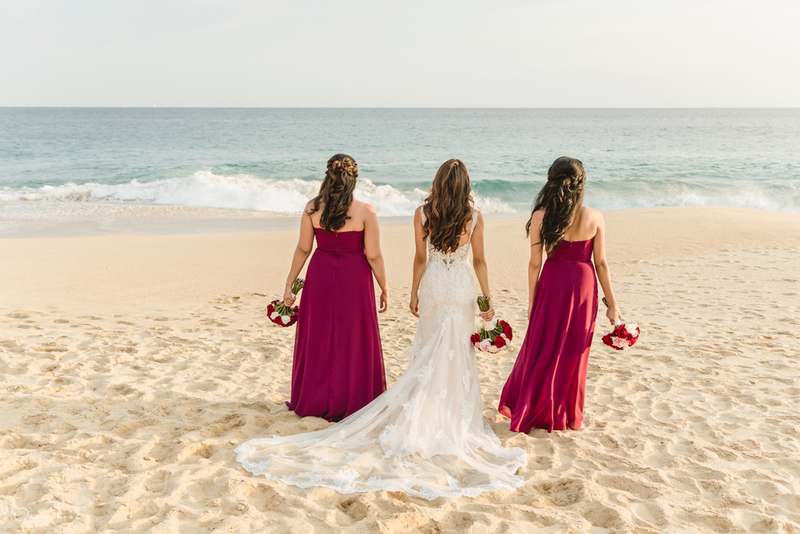 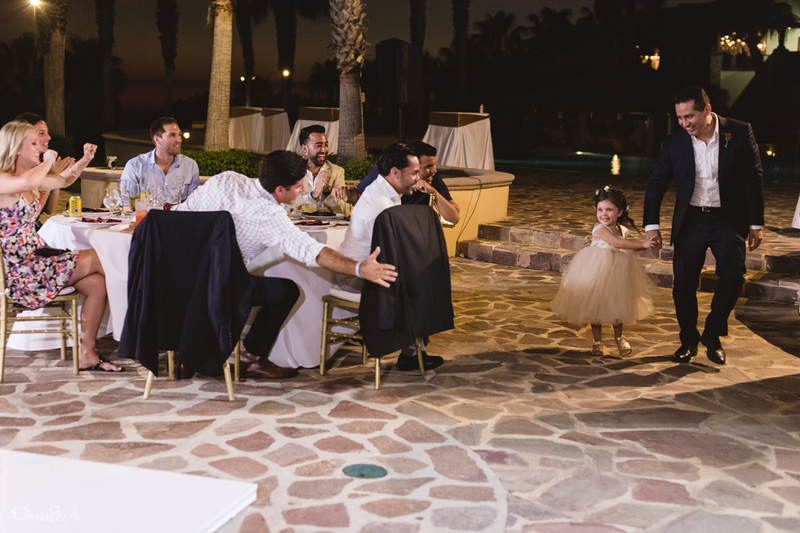 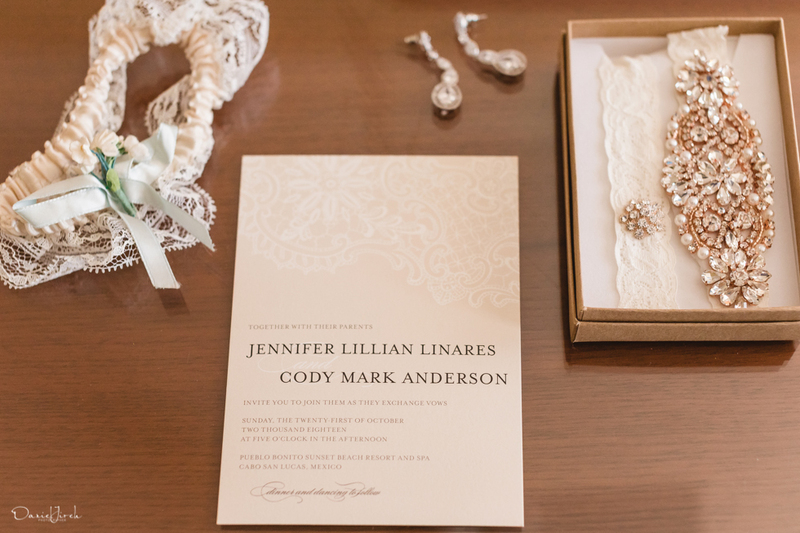 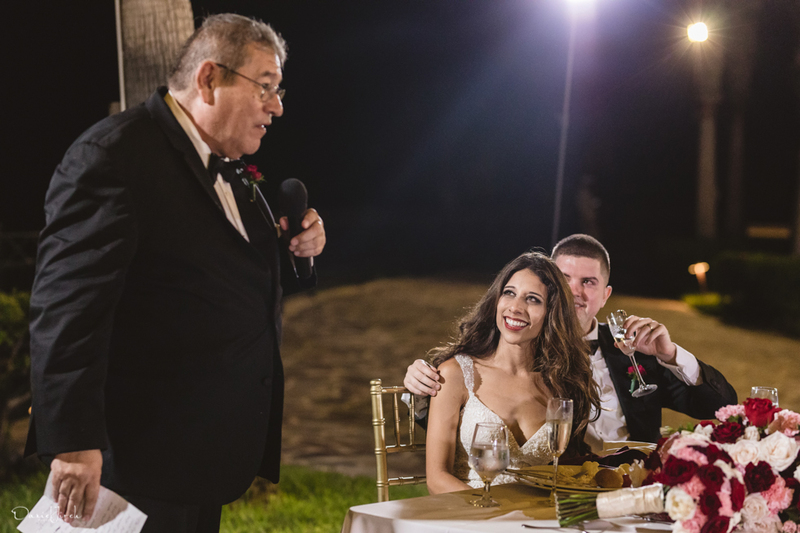 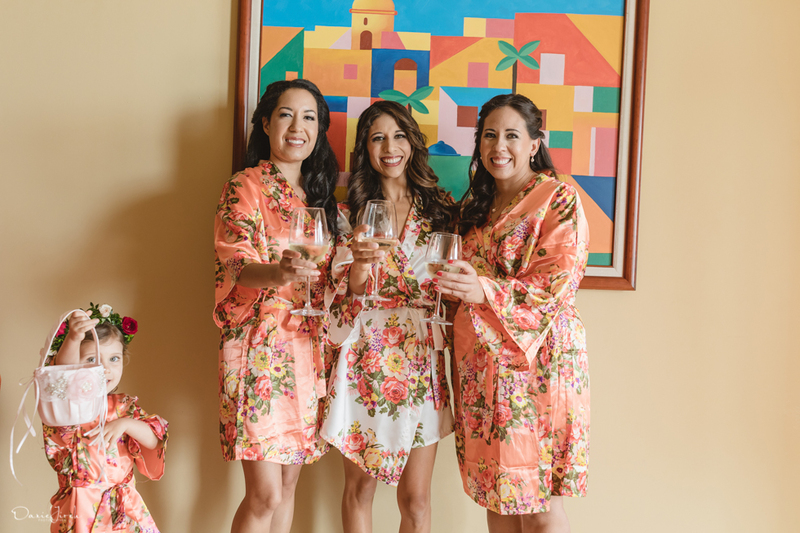 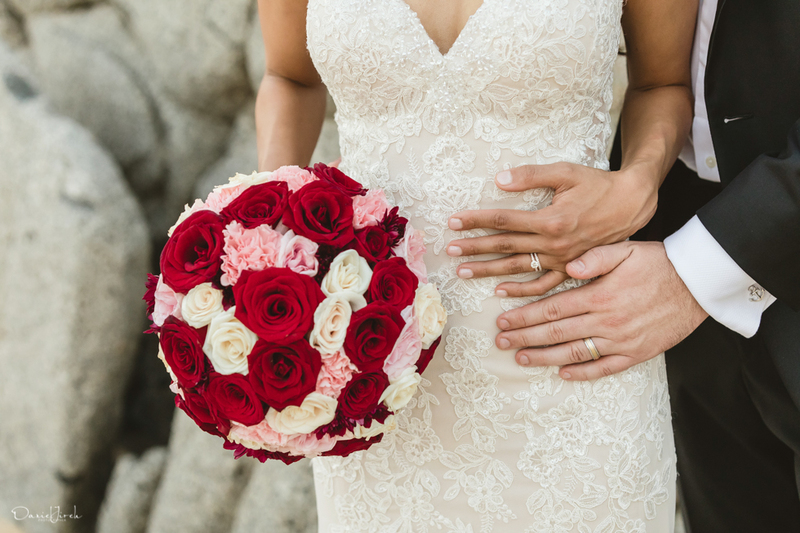 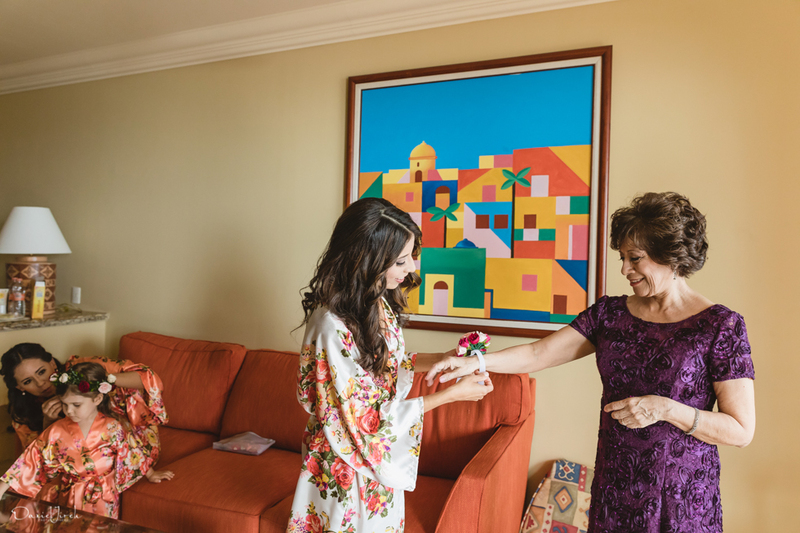 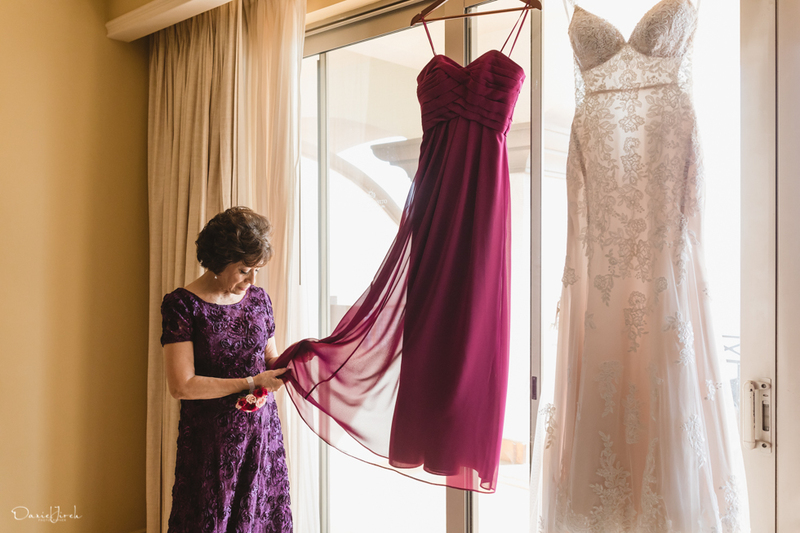 JENNIFER AND CODY’S LOS CABOS DESTINATION WEDDING AT PUEBLO BONITO SUNSET BEACH, CABO SAN LUCAS, MEXICO. 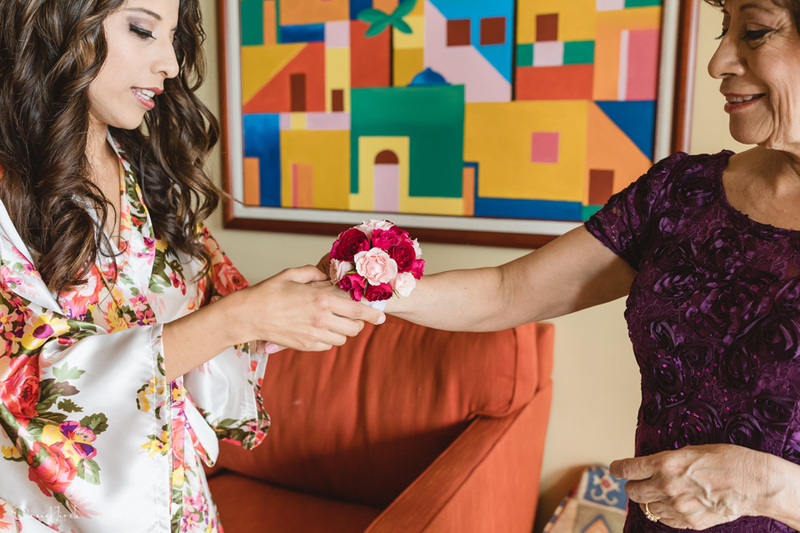 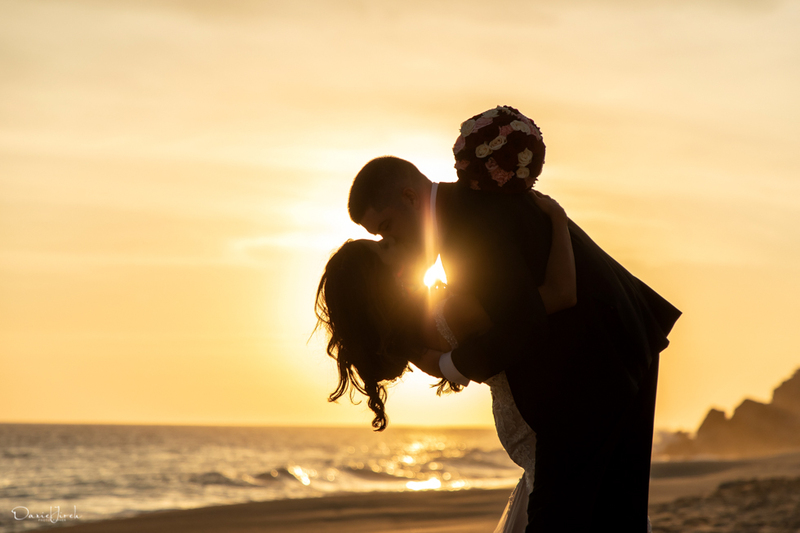 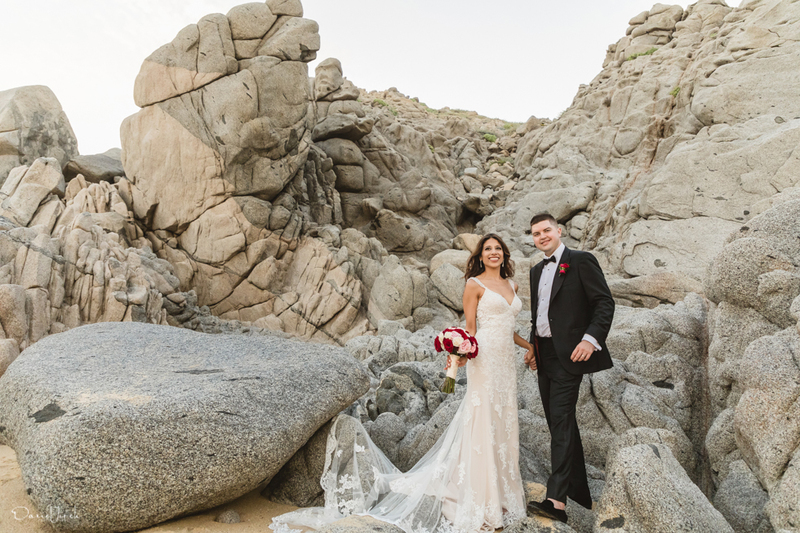 We love a good Pueblo Bonito Sunset Beach wedding, and we had yet another chance to shoot a great one this past October when Jennifer and Cody chose us to photograph their nuptials. 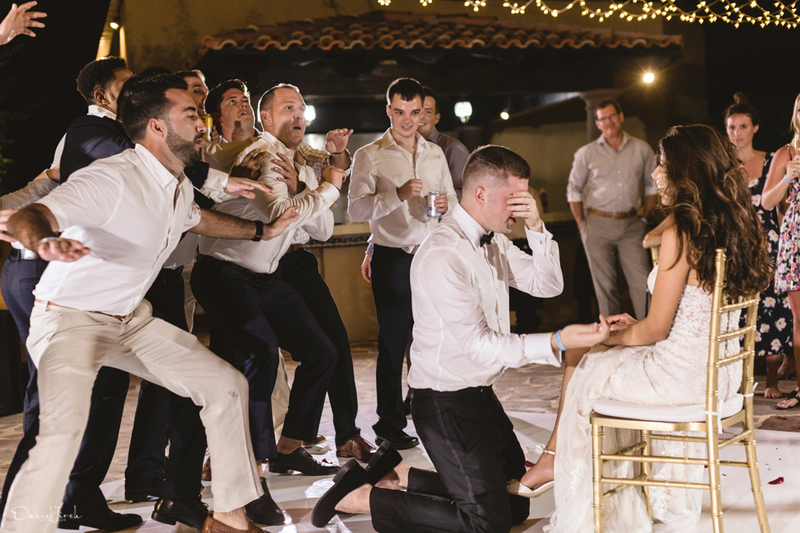 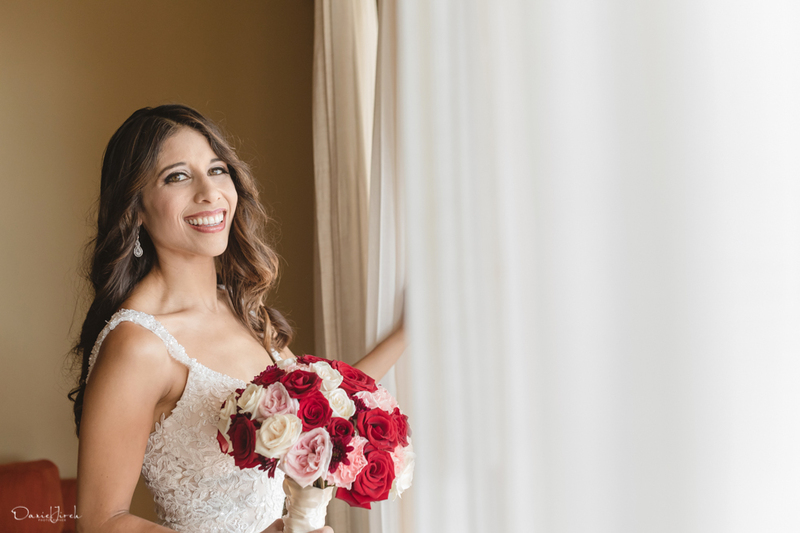 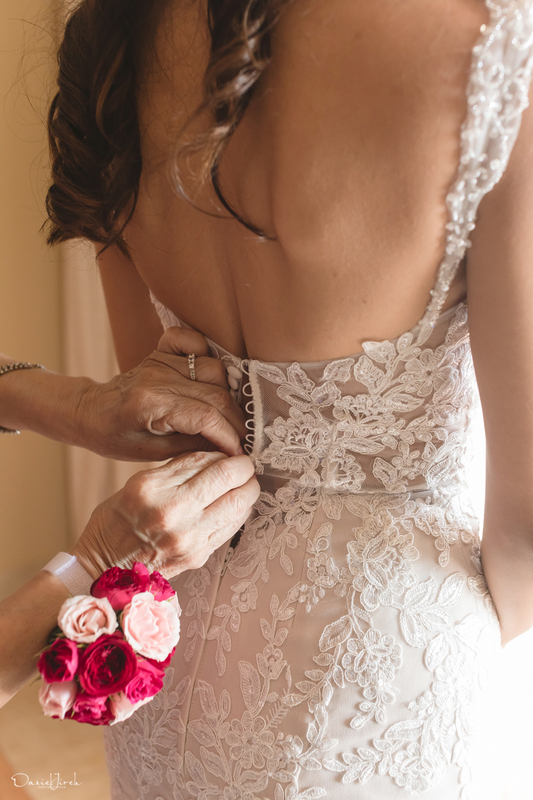 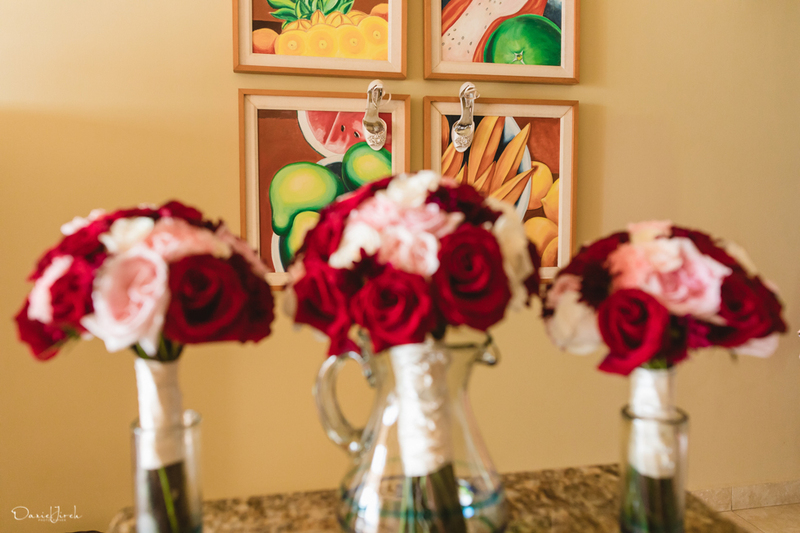 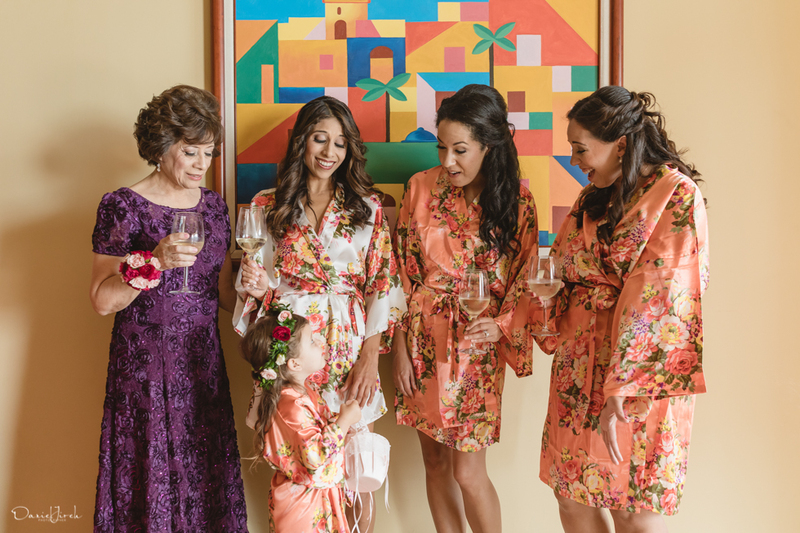 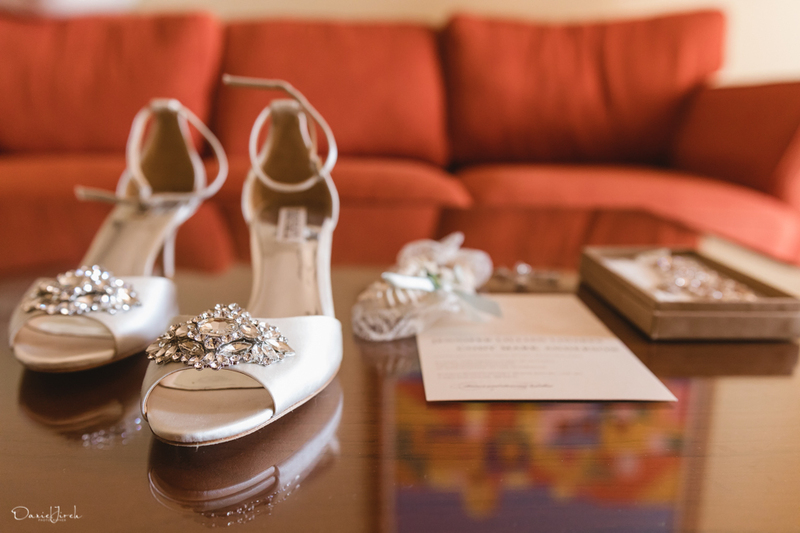 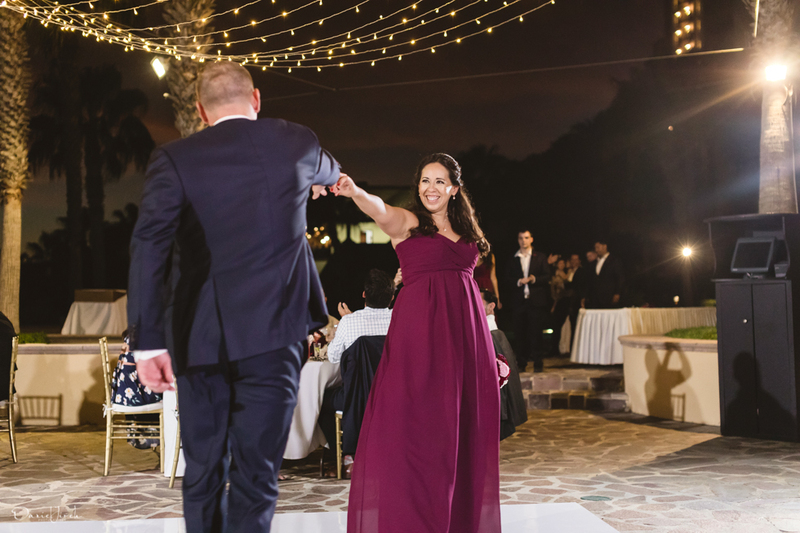 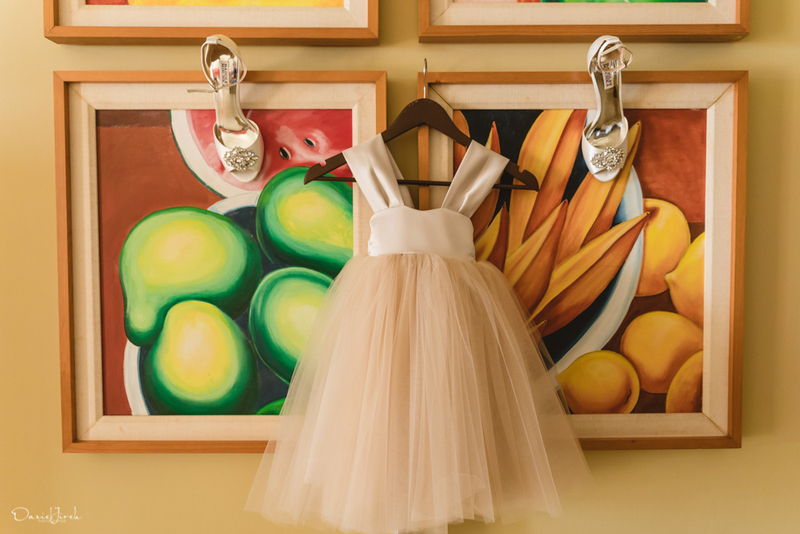 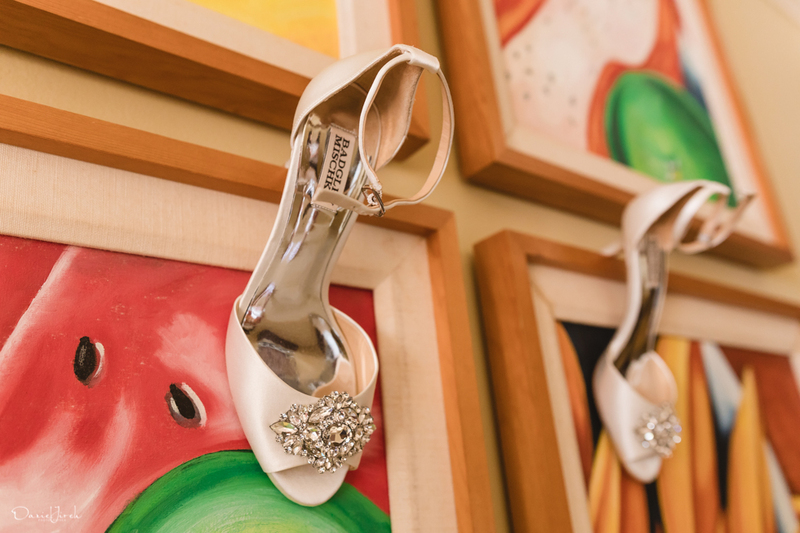 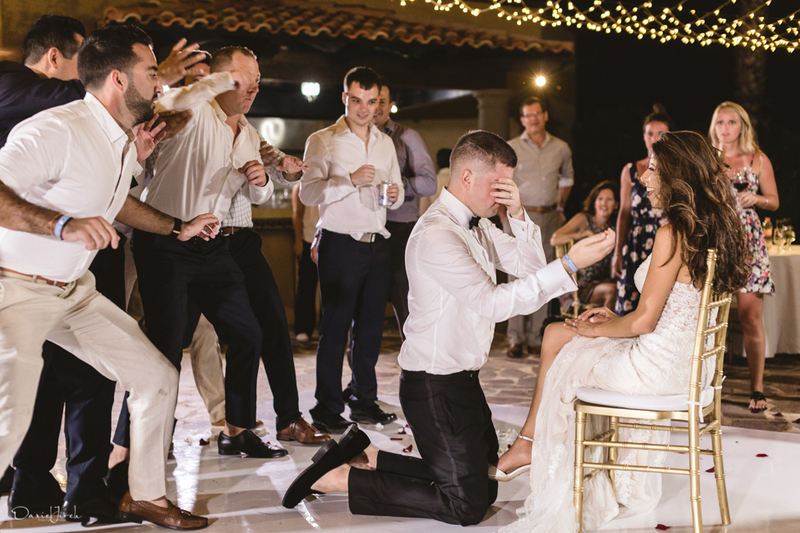 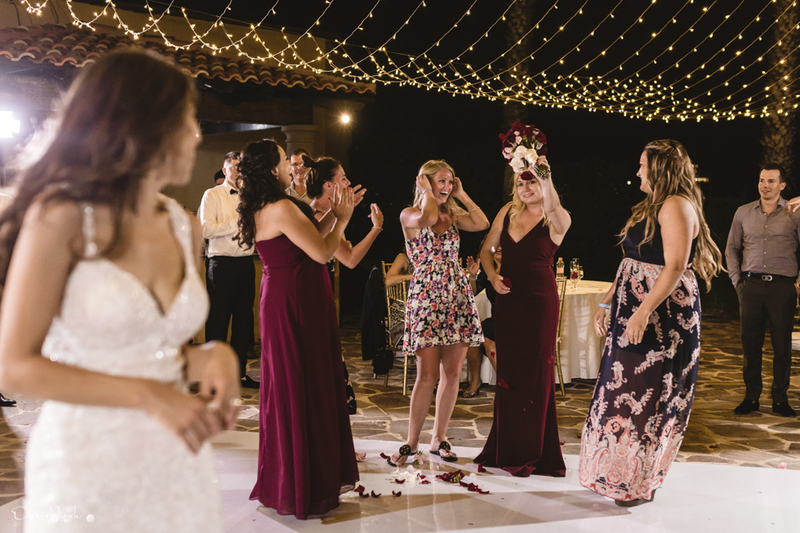 The easygoing couple chose to keep things relaxed and casual, focusing on creating a dynamic experience full of fun and frivolity rather than stressing over the small stuff. 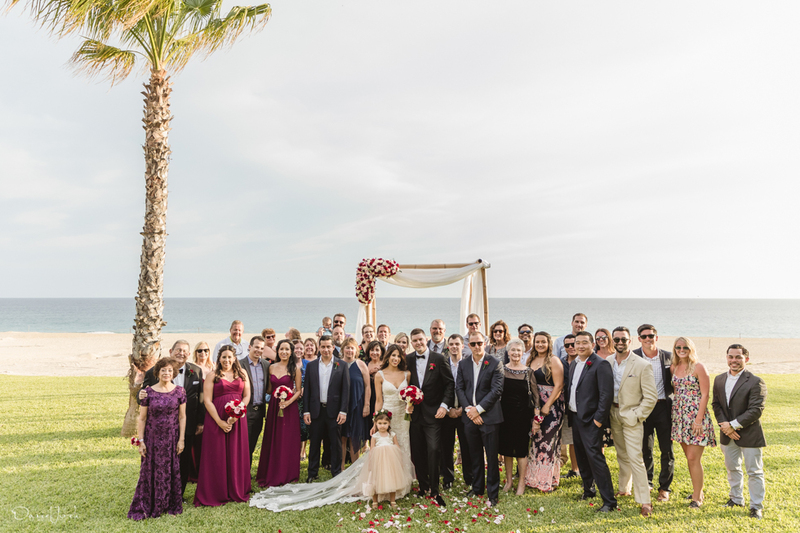 With an amazing group of A list vendors behind them, there is no doubt that Jennifer, Cody and wedding planner Gaby Nagai pulled it off! 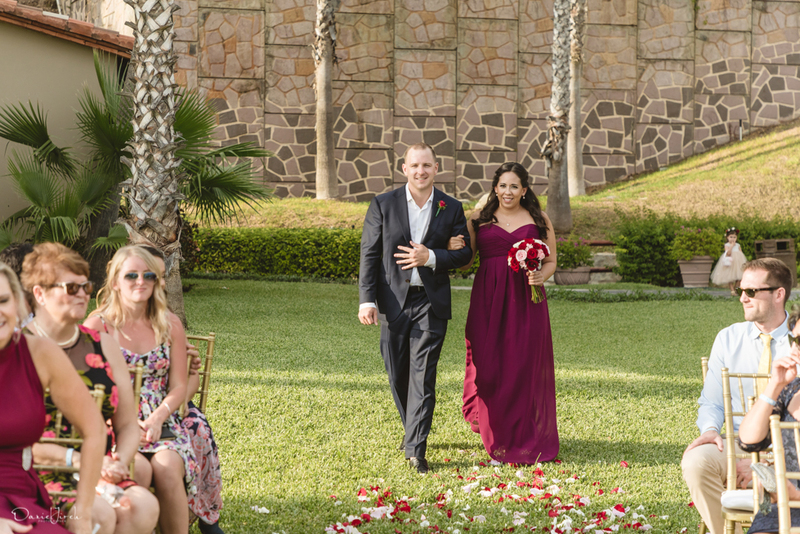 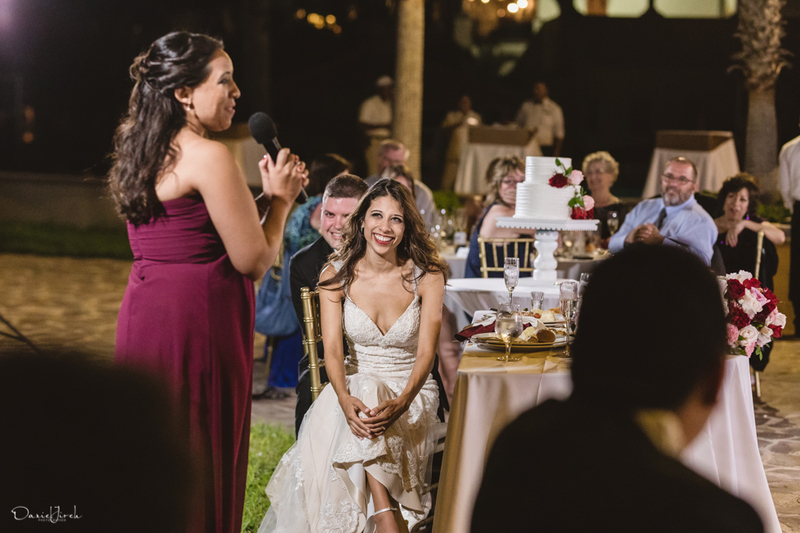 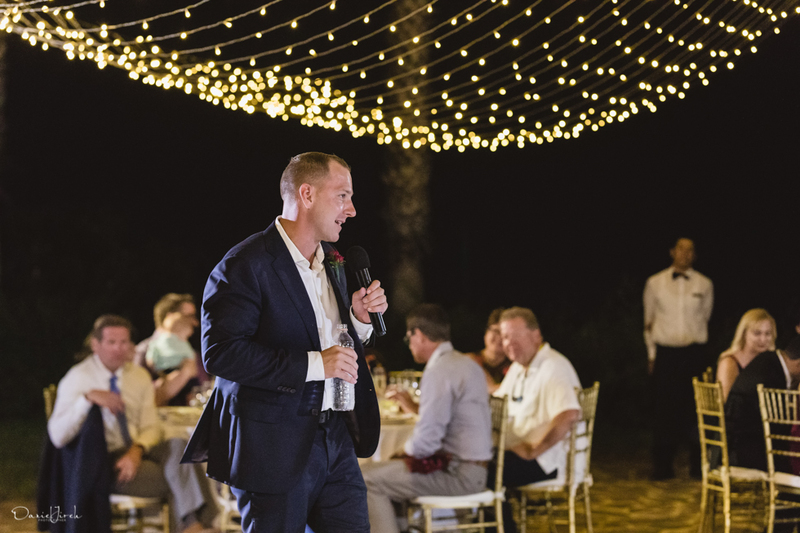 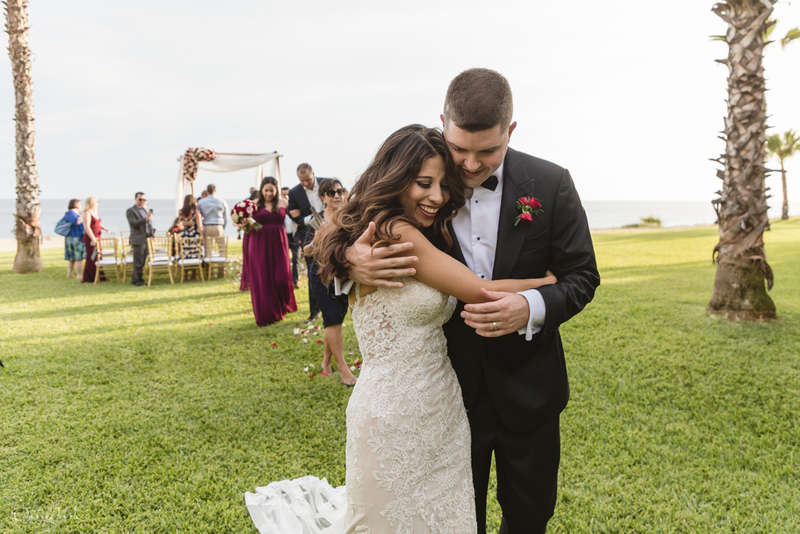 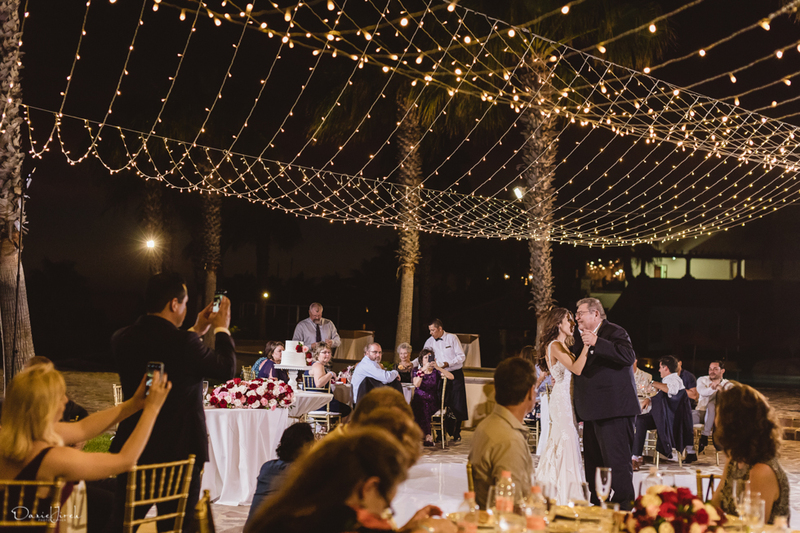 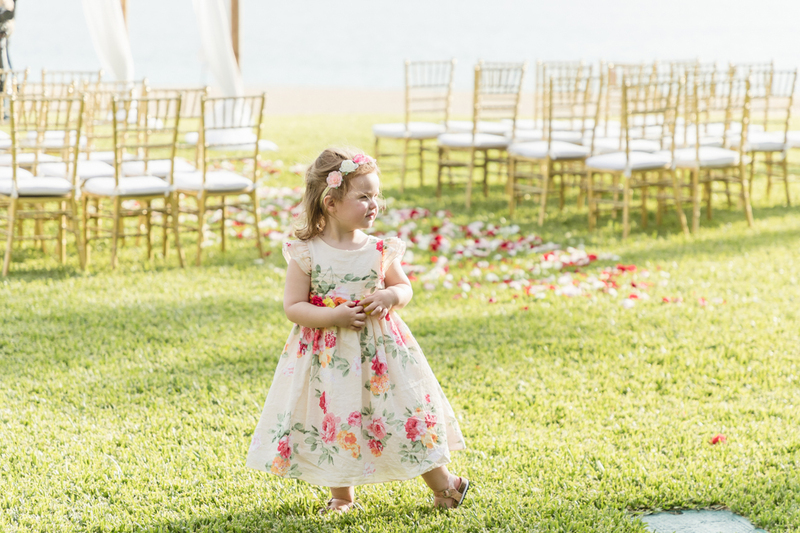 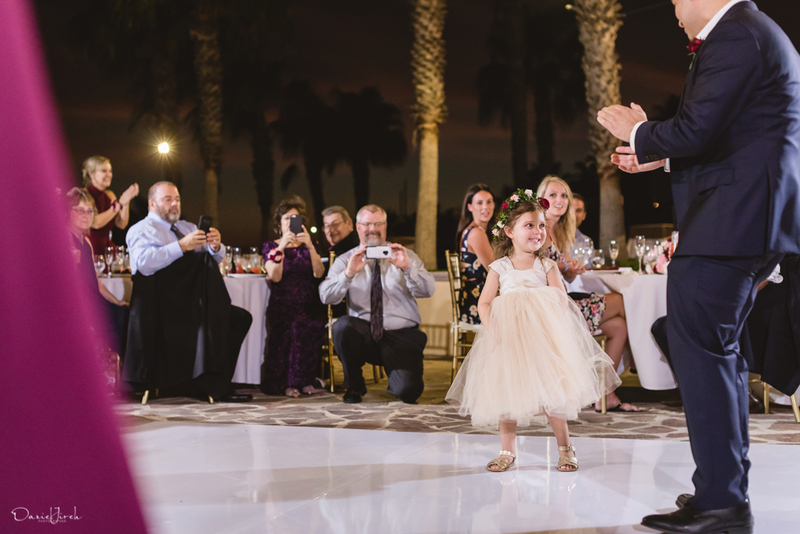 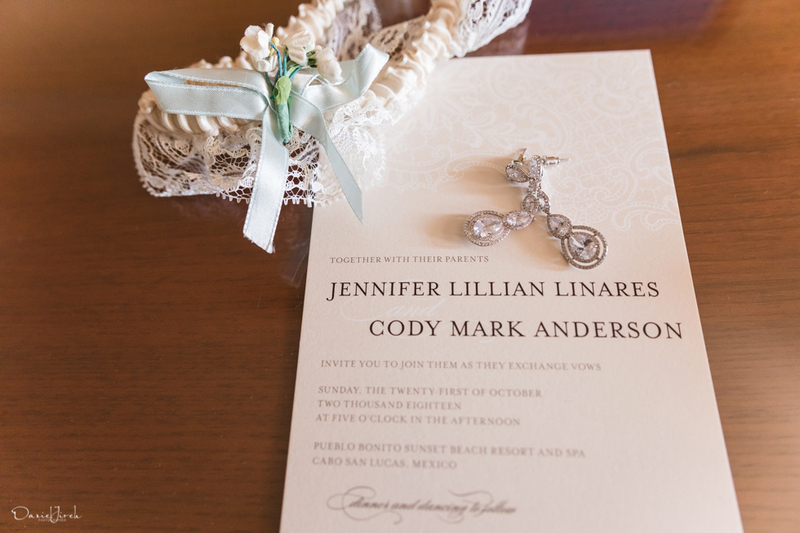 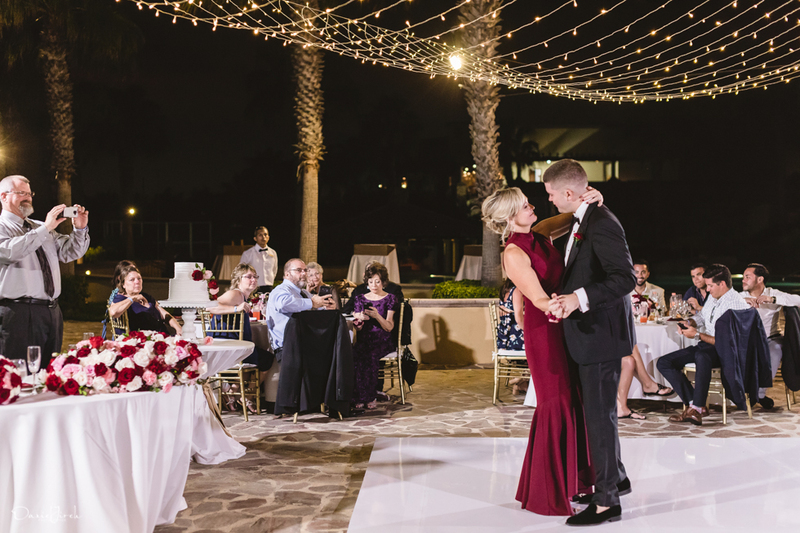 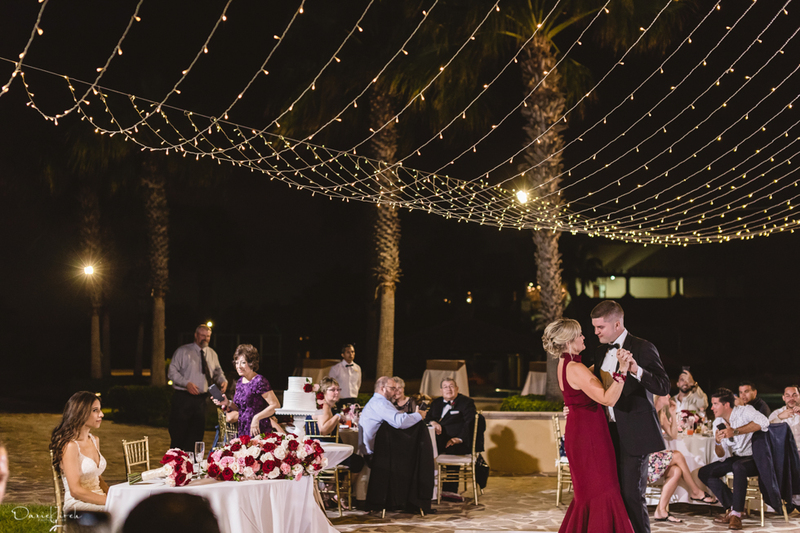 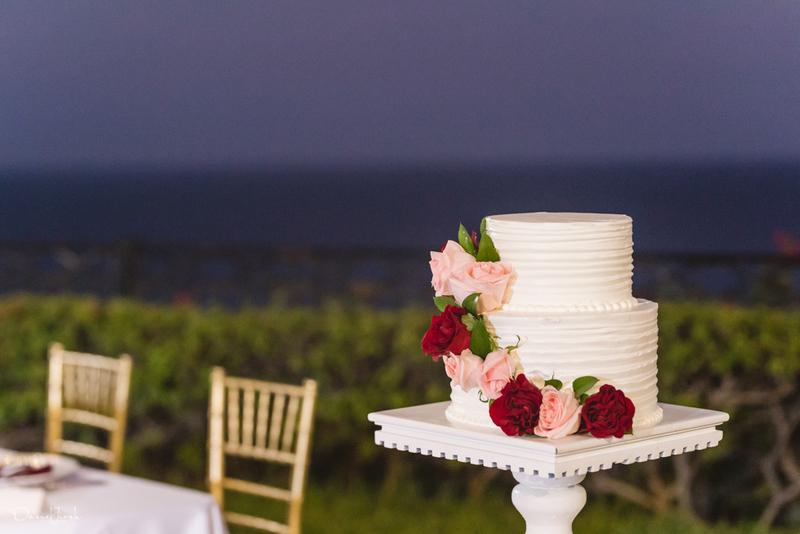 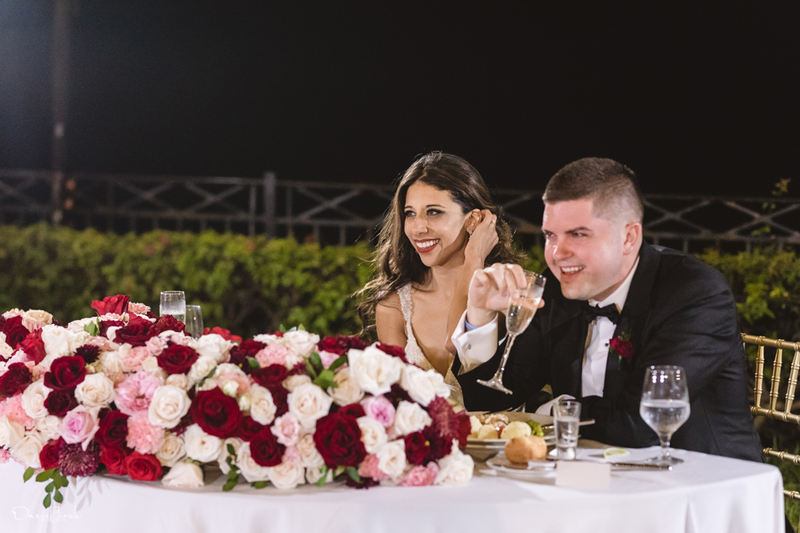 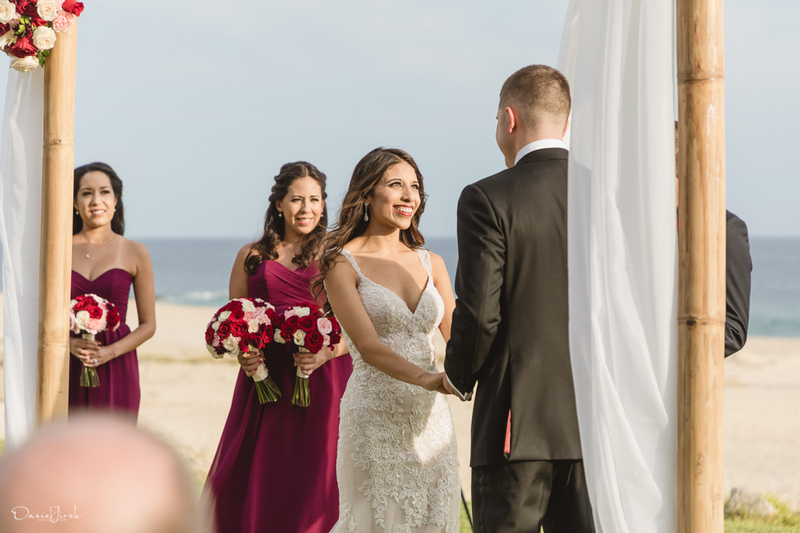 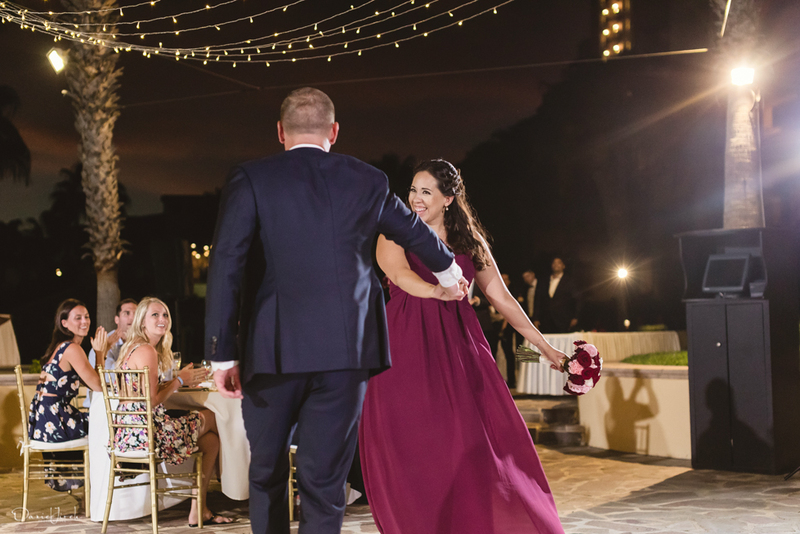 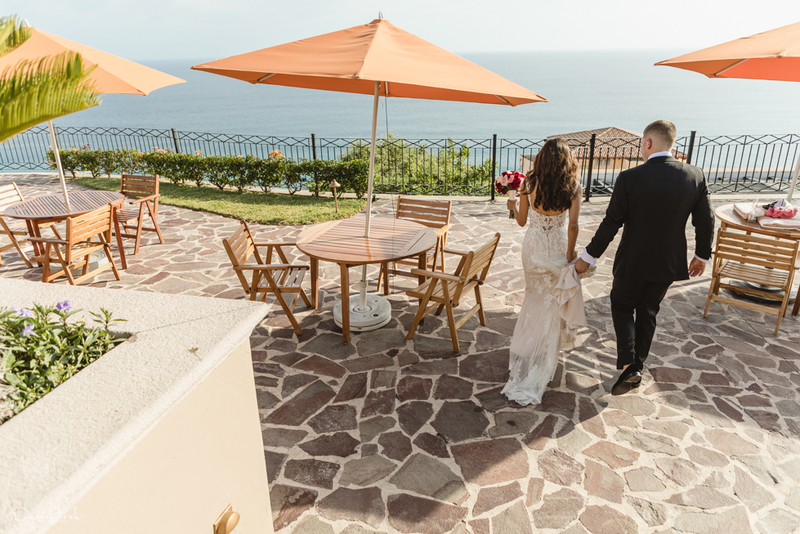 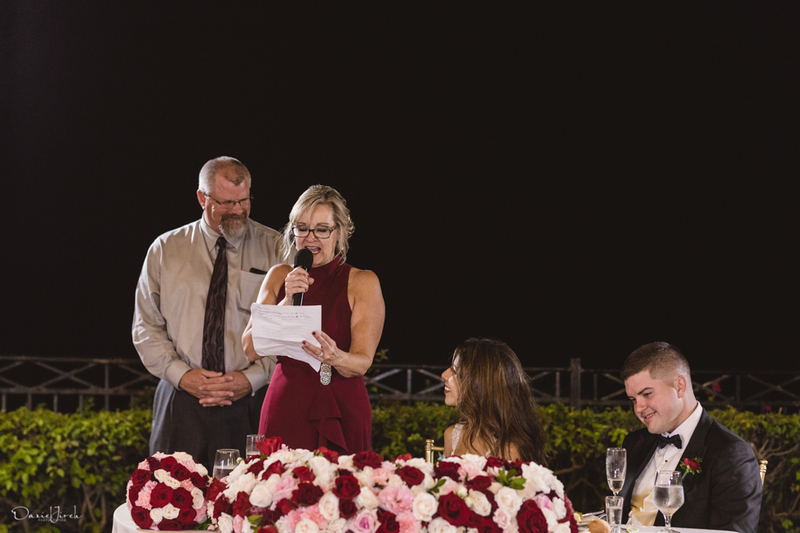 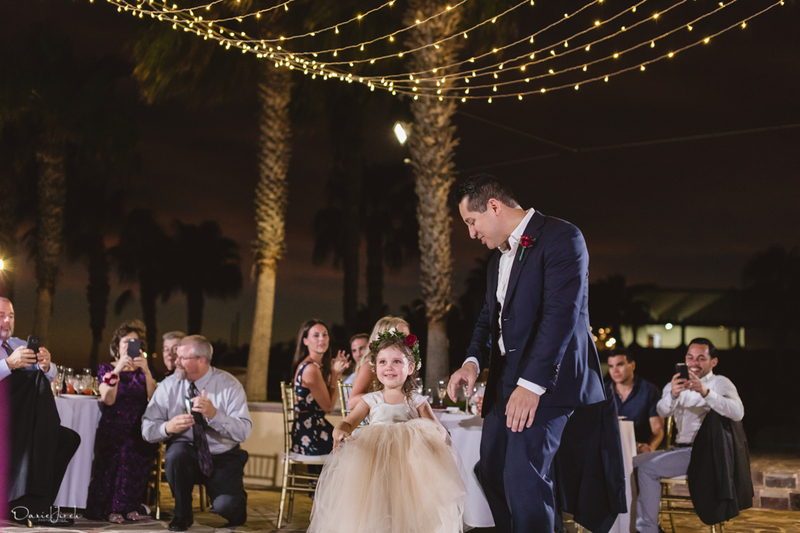 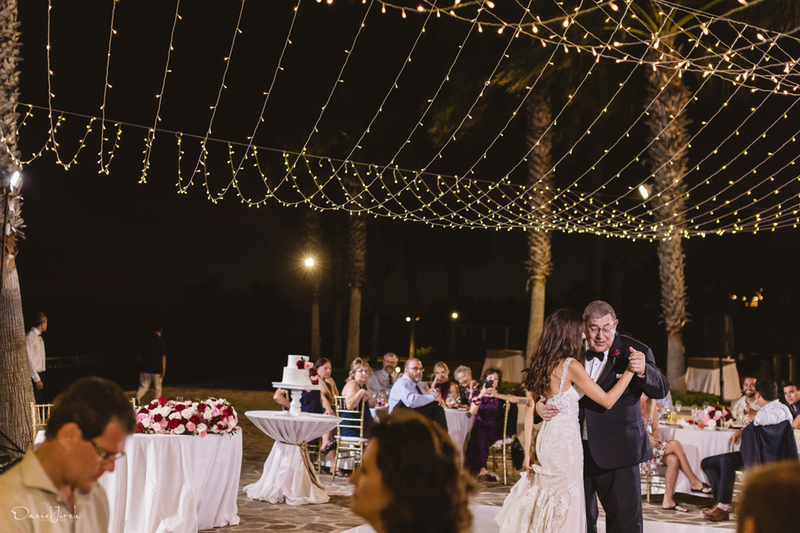 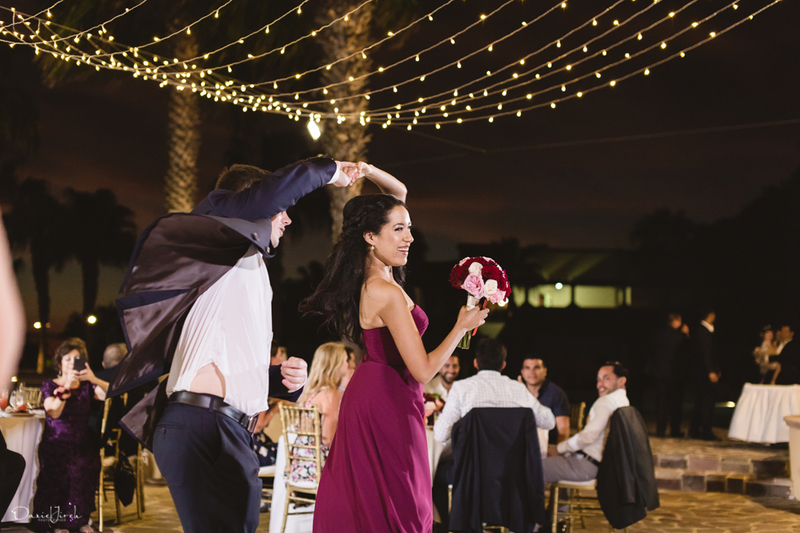 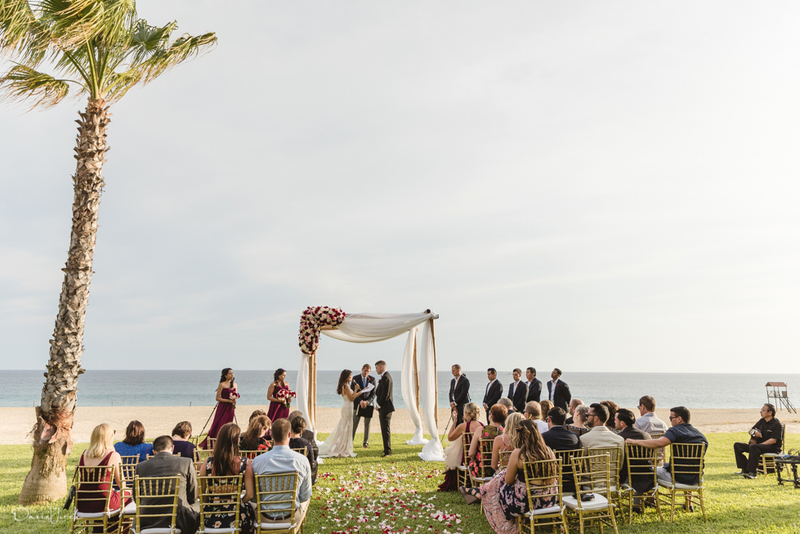 Jennifer and Cody chose to forego a toes-in-the-sand ceremony in favor of the resort’s grass terrace, overlooking the hotel’s manicured gardens and with views to the Pacific Ocean. 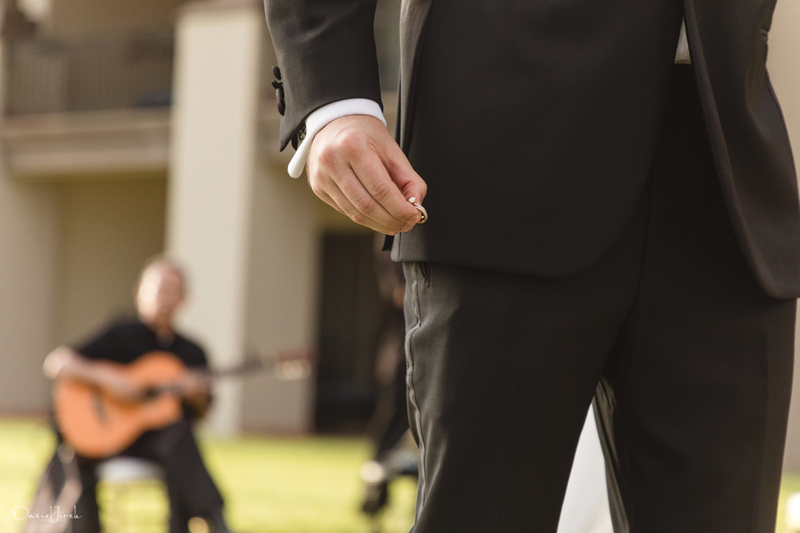 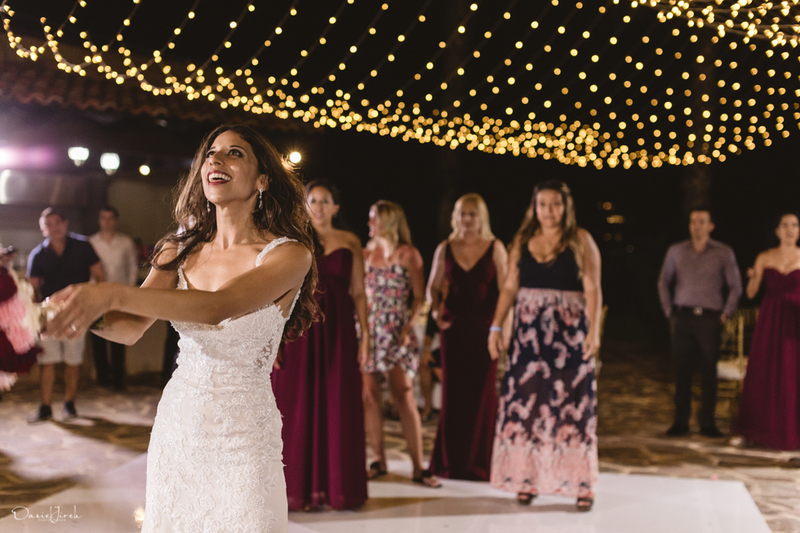 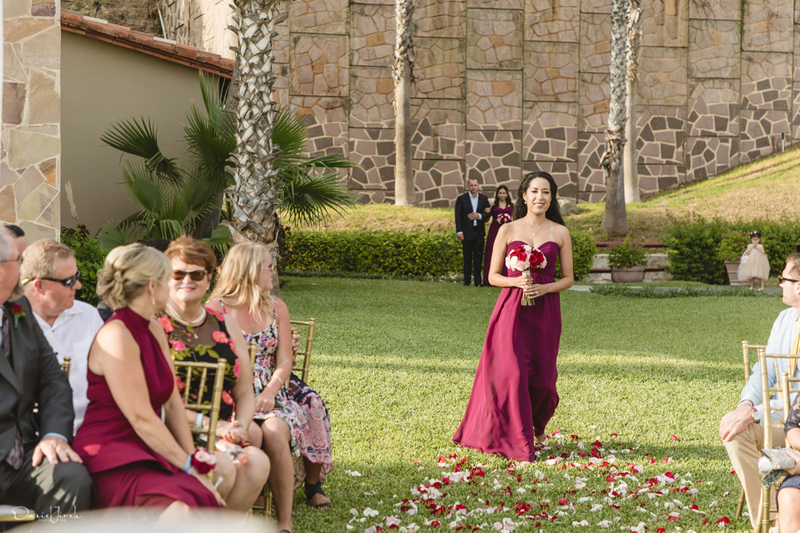 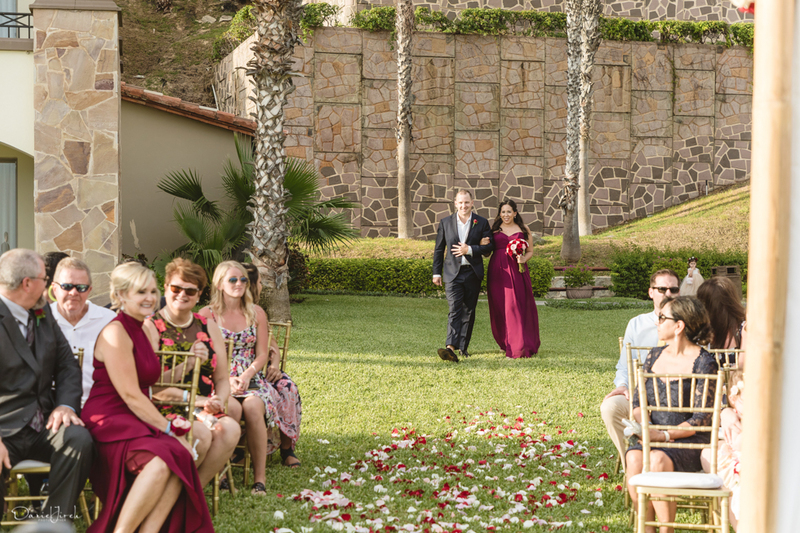 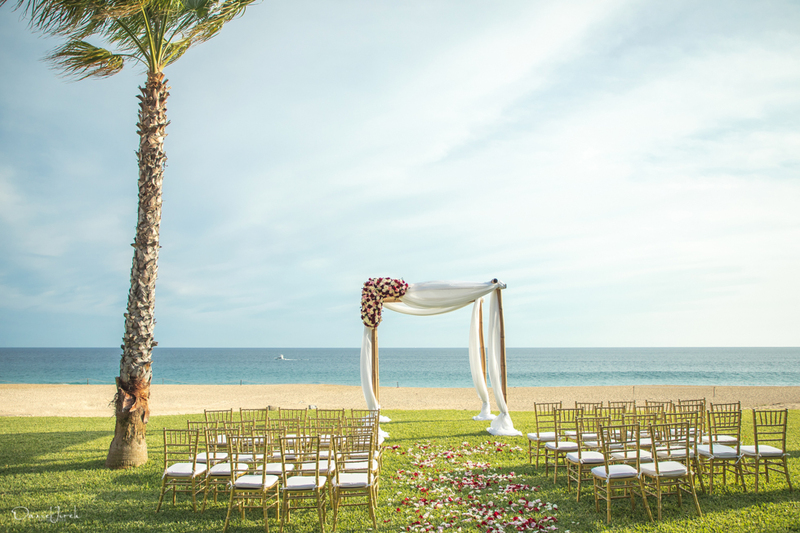 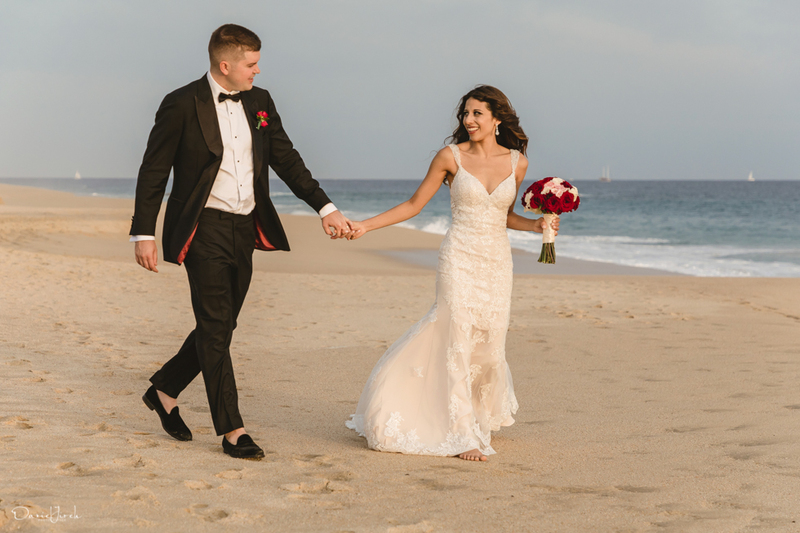 While beach ceremonies are a favorite for the destination bride, hosting your nuptials on grass or pavement allows guests to keep those heels on and be comfortable, as well as making it much easier for yours truly to run around after those candid, gone-in-the-blink-of-an-eye moments. 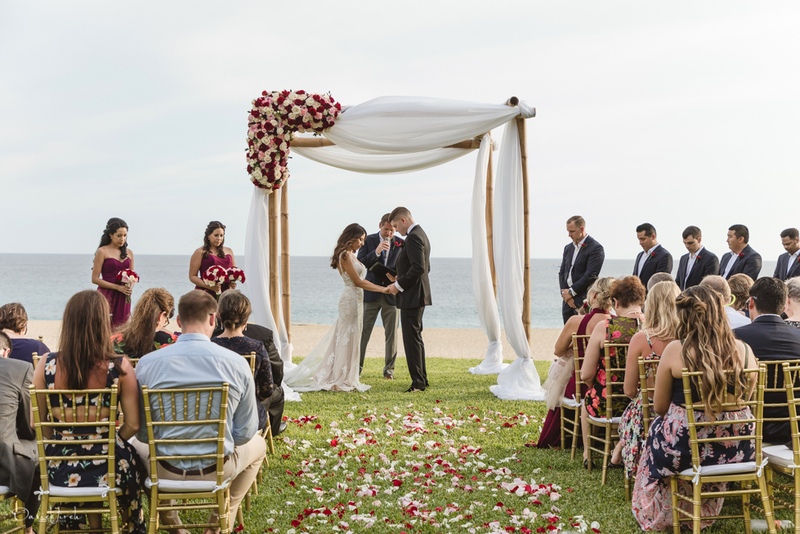 A lover of all things bold and beautiful, Jennifer collaborated with The Main Event Cabo to create a stunningly simple ceremony setup. 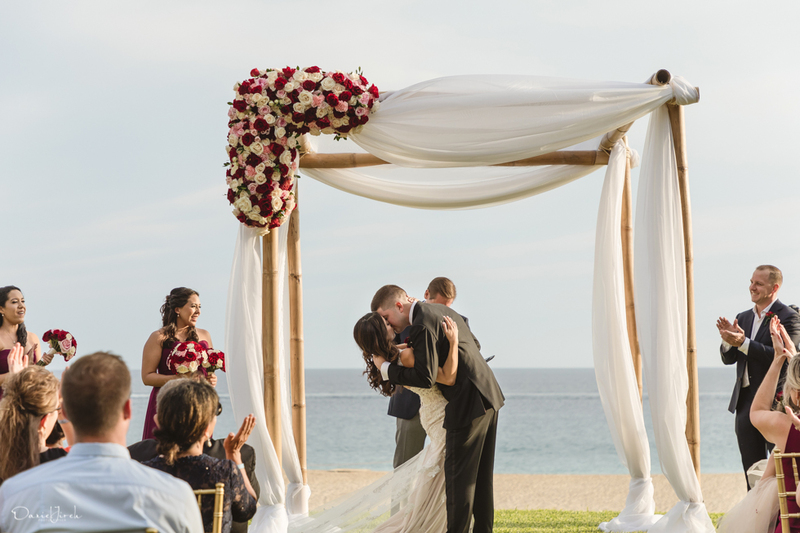 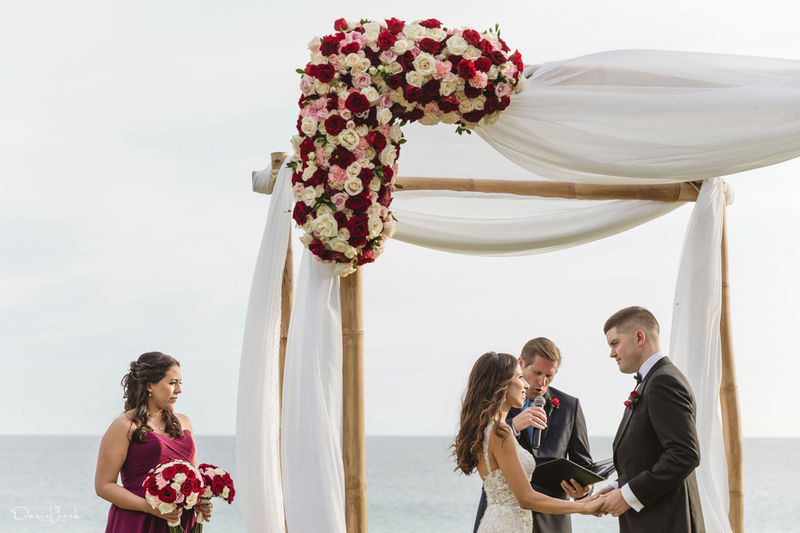 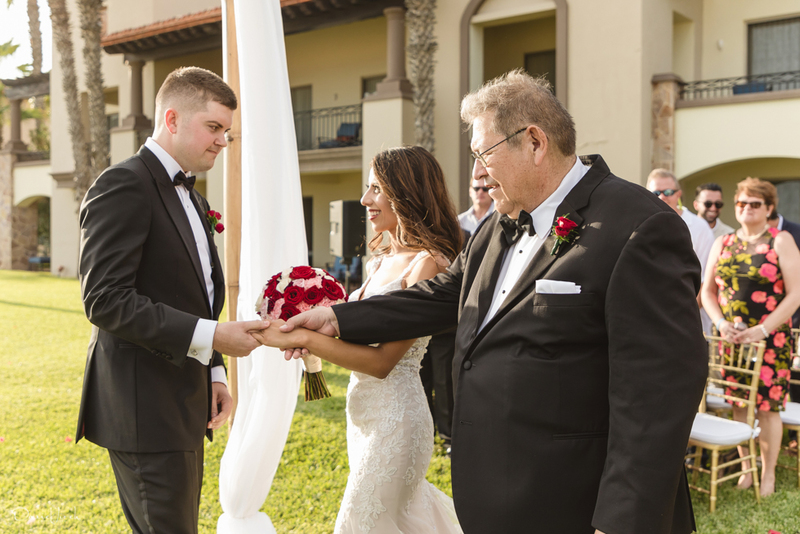 A pared down bamboo chuppah with white fabric draping and gold chiavari chairs were given a pop of color by Emprio Arte Floral, who constructed an imposing corner piece of red, pale pink and cream flowers. 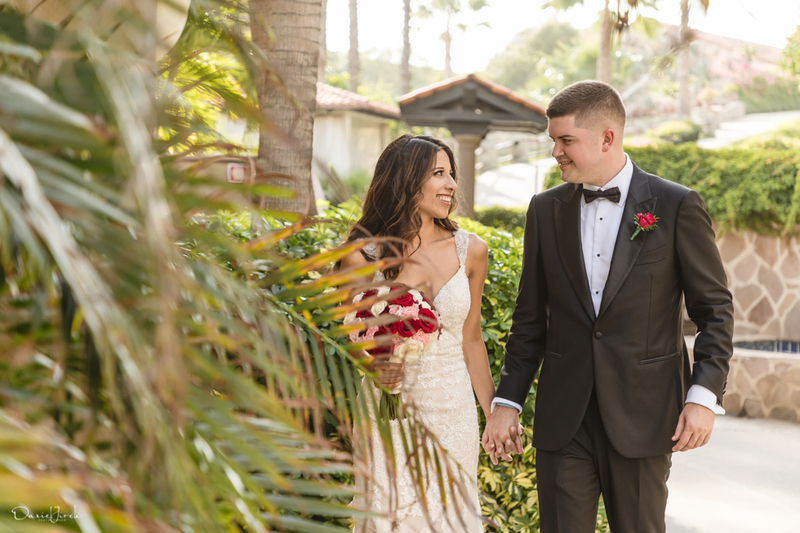 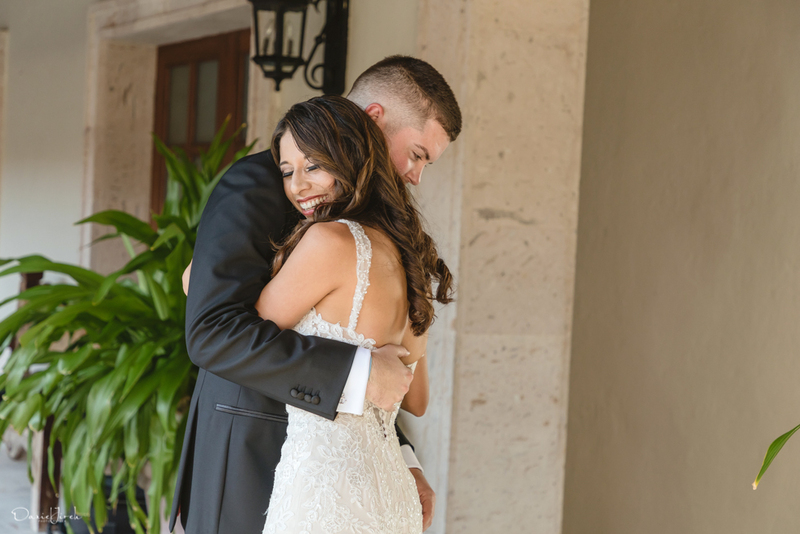 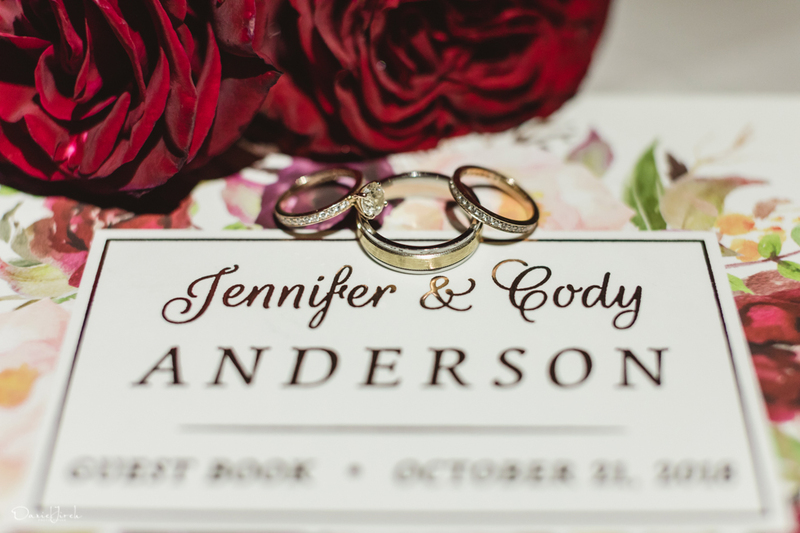 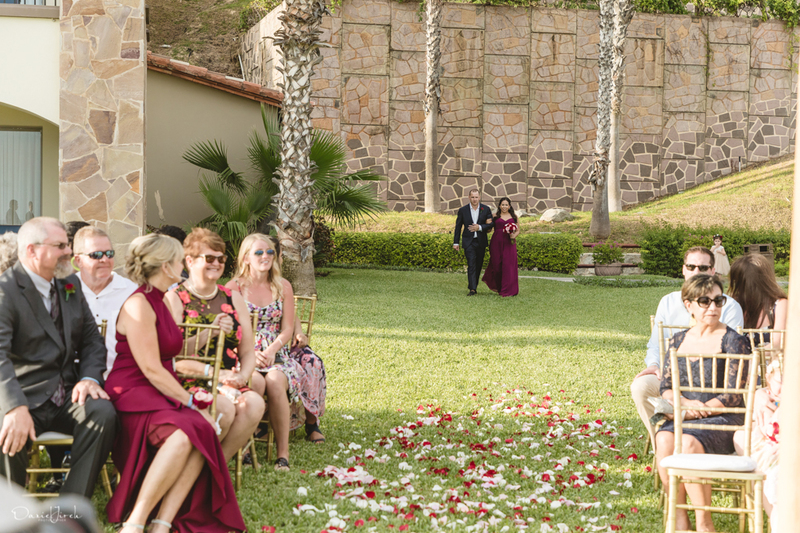 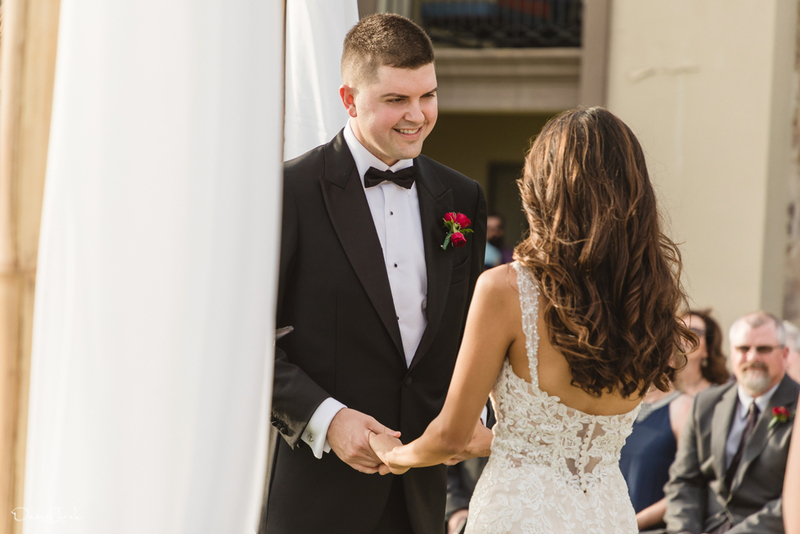 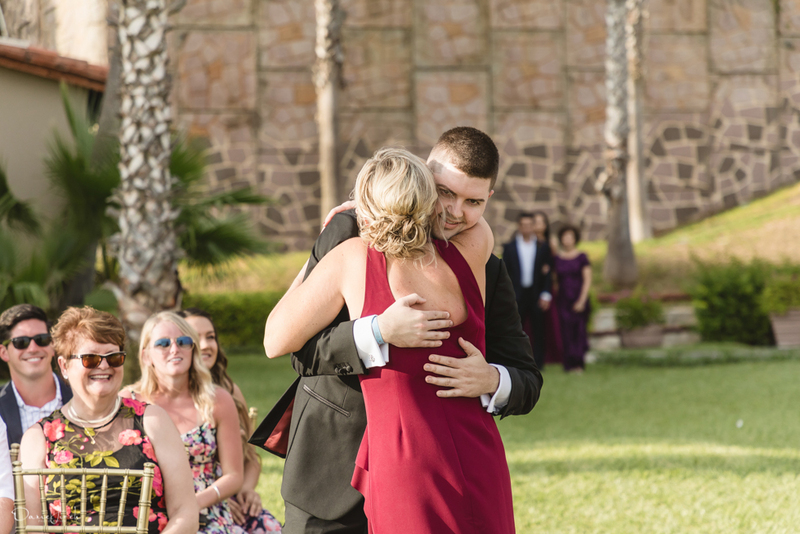 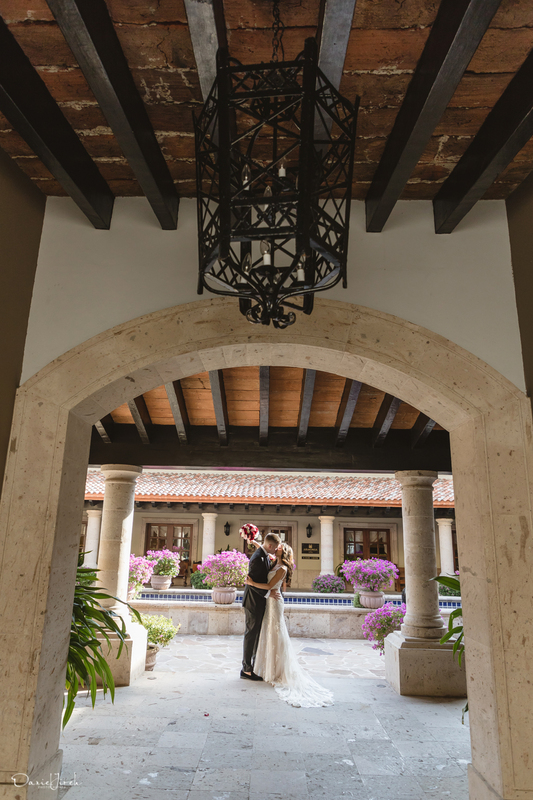 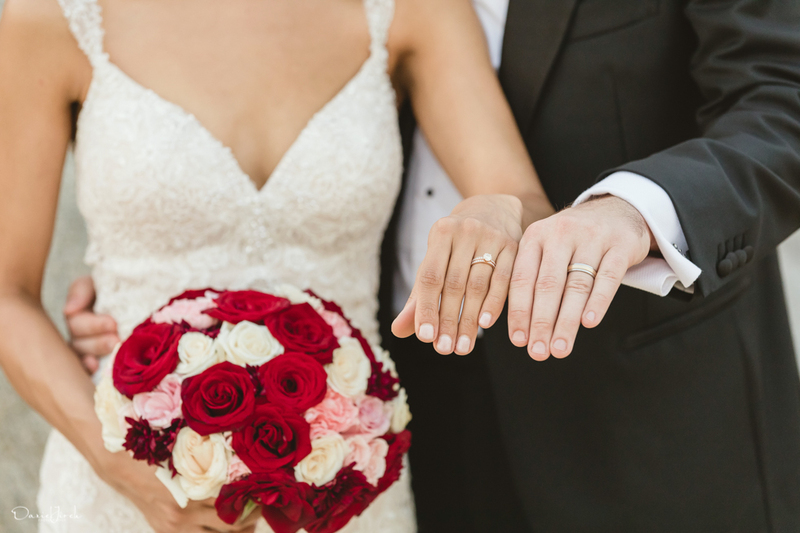 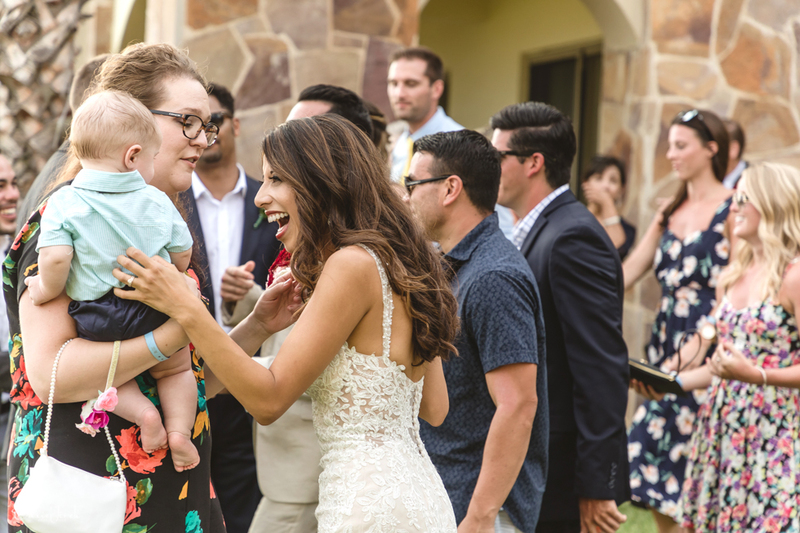 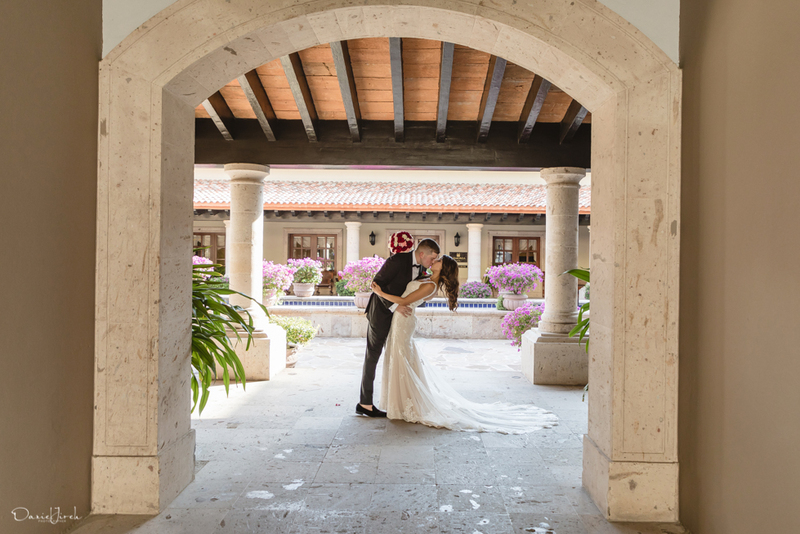 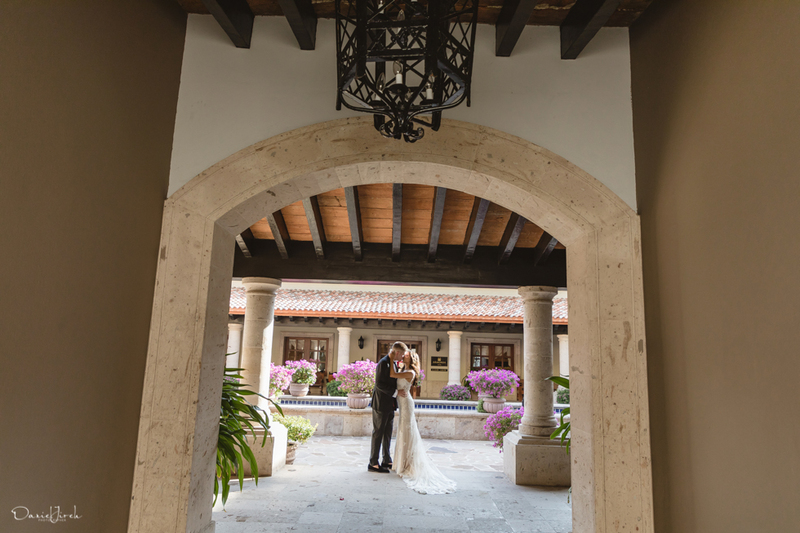 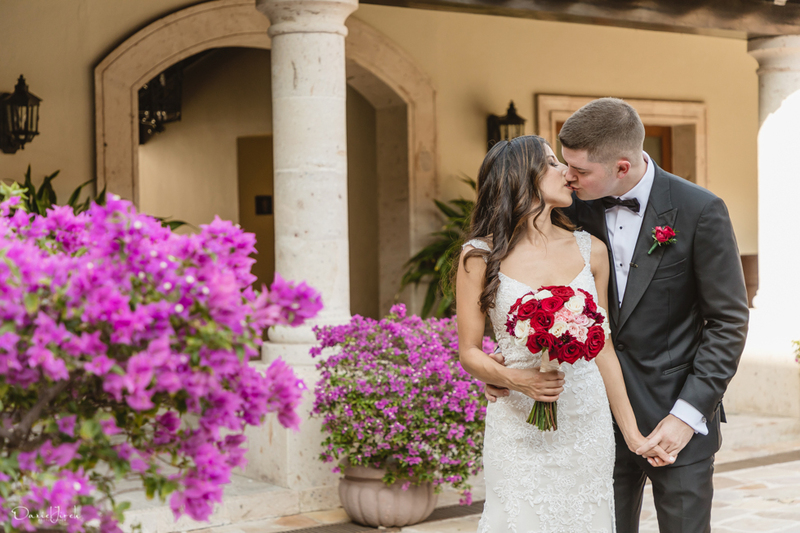 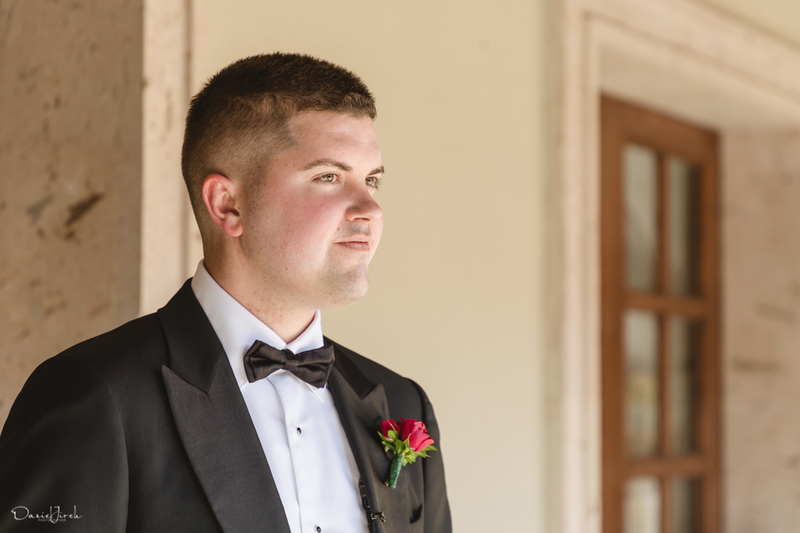 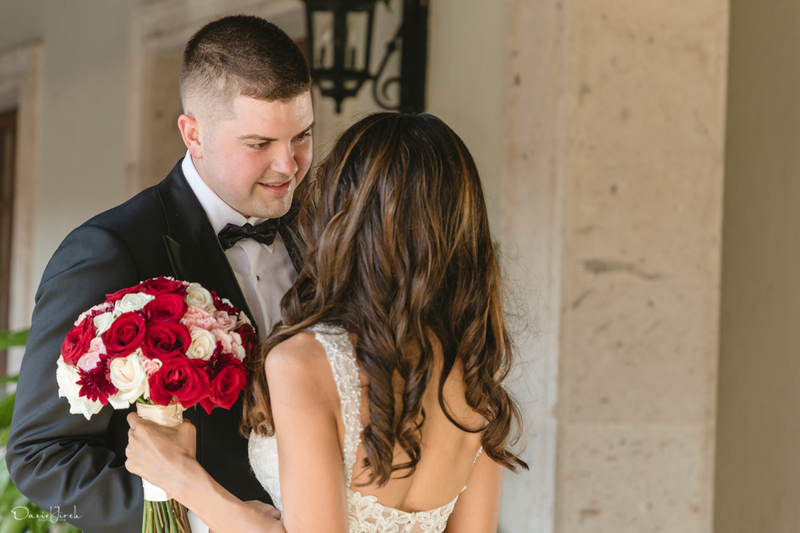 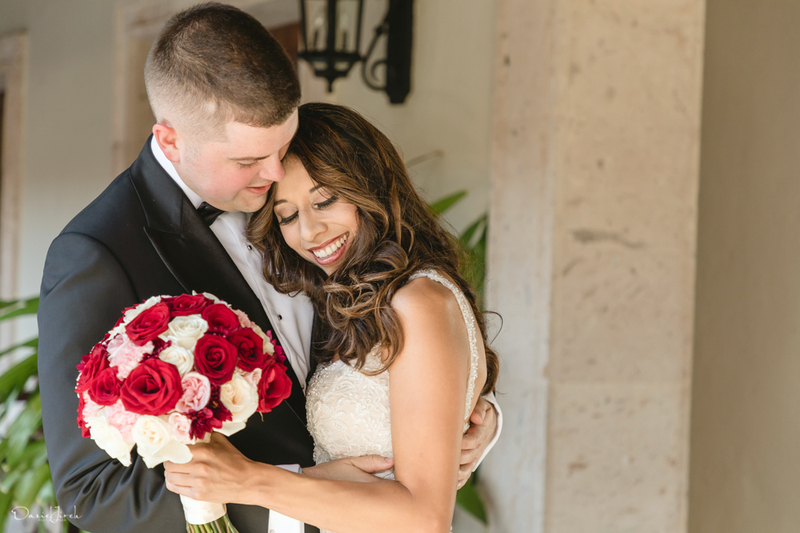 Having already shared a pre-ceremony first look in the privacy of the hotel’s Chapel courtyard, Jennifer and Cody’s nerves were well and truly behind them, resulting in a sweet and intimate ceremony that was greatly appreciated by all in attendance. 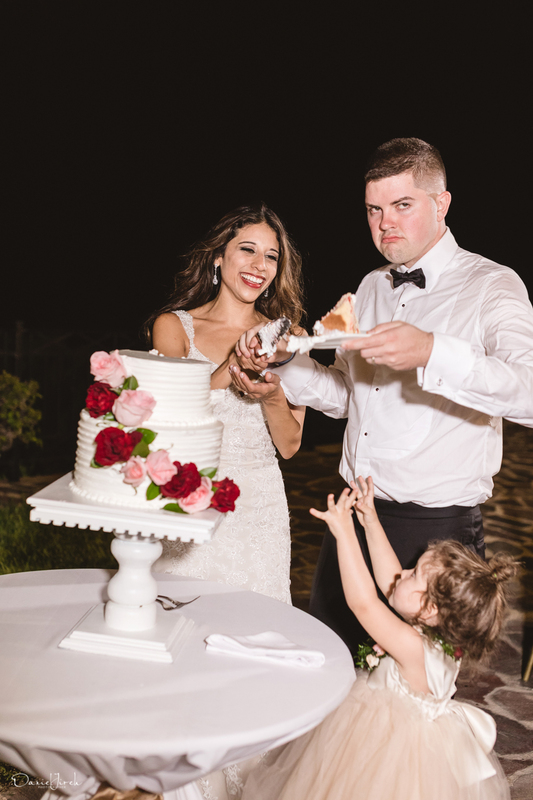 Our post-ceremony portrait session was a gem. 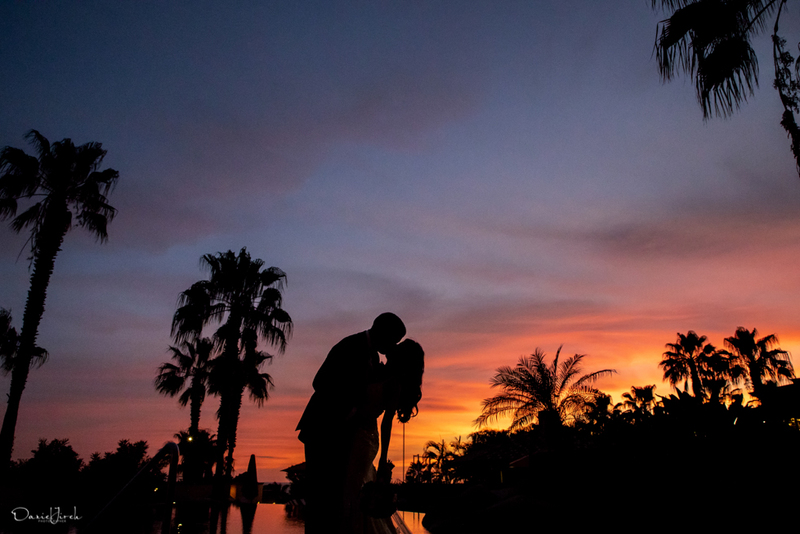 We were blessed with a lilac, pink and pale peach sunset as evening approached, which quickly deepened to indigo blue and burnt orange as the sun melted into the horizon. 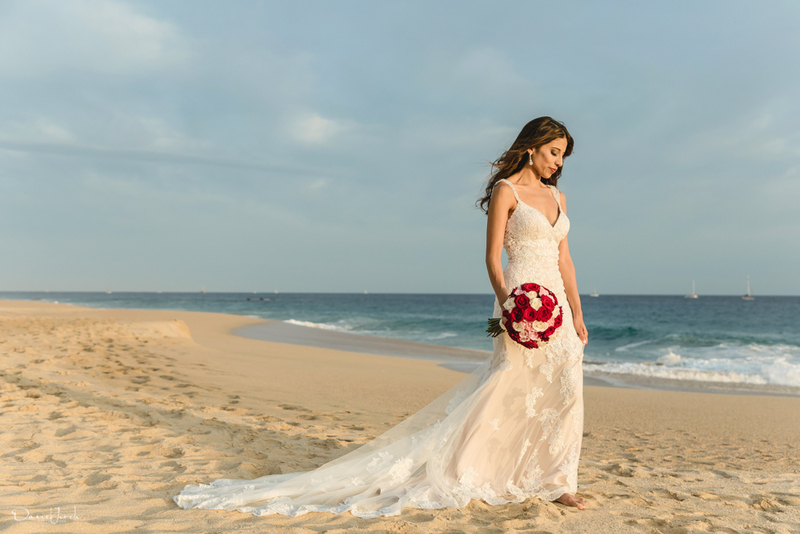 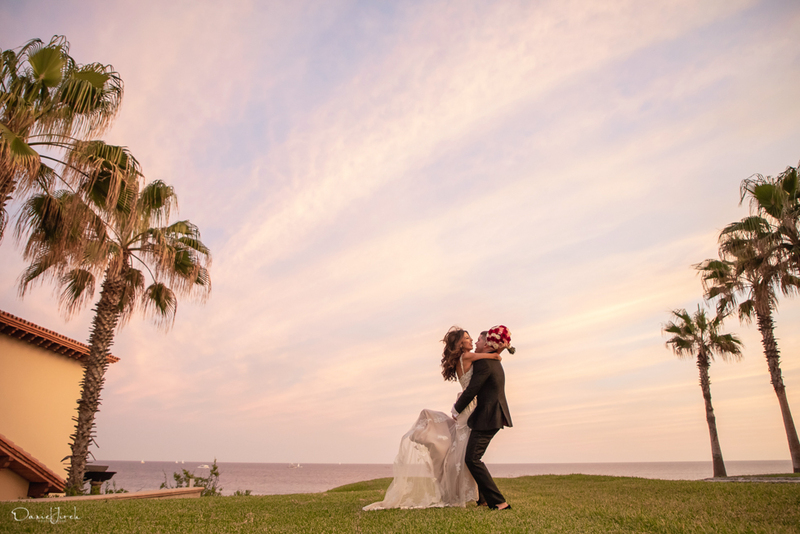 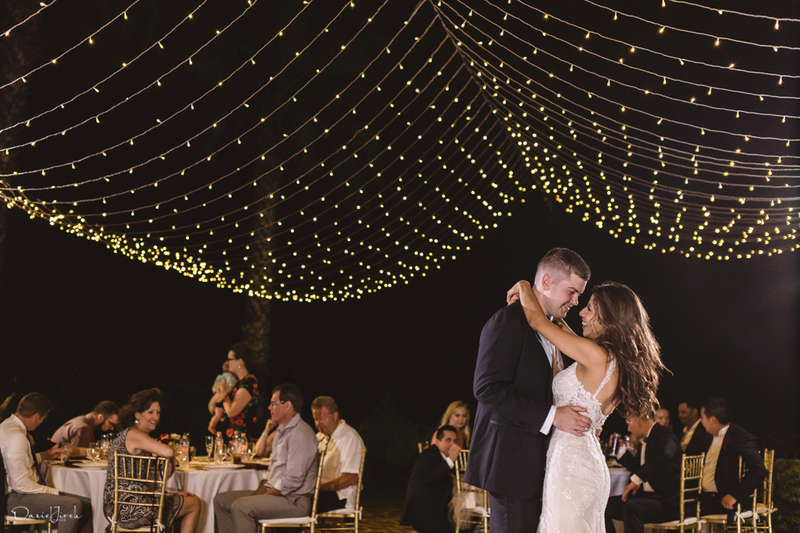 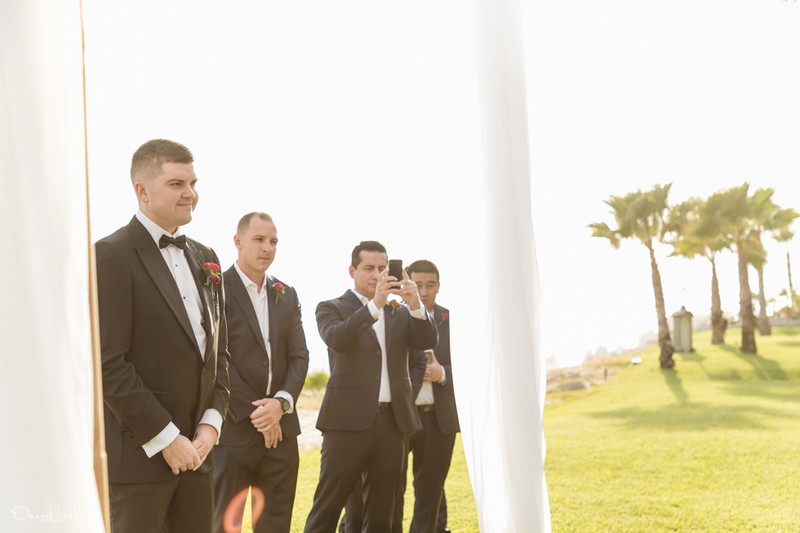 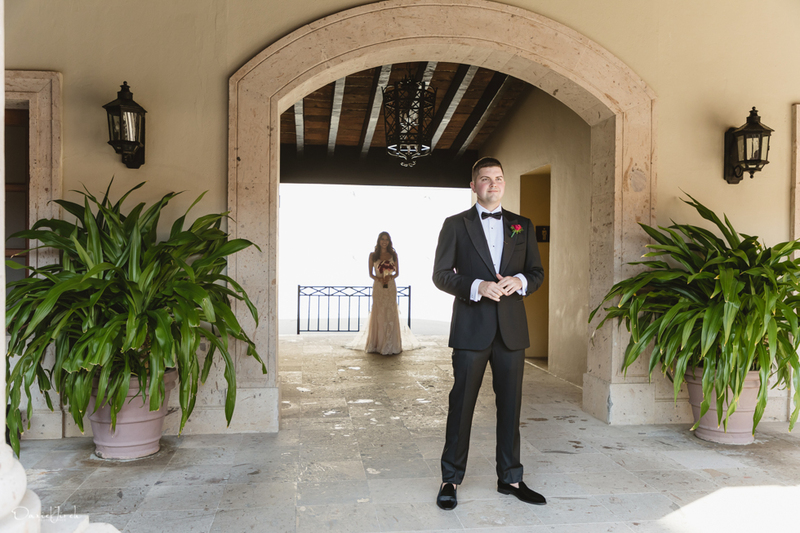 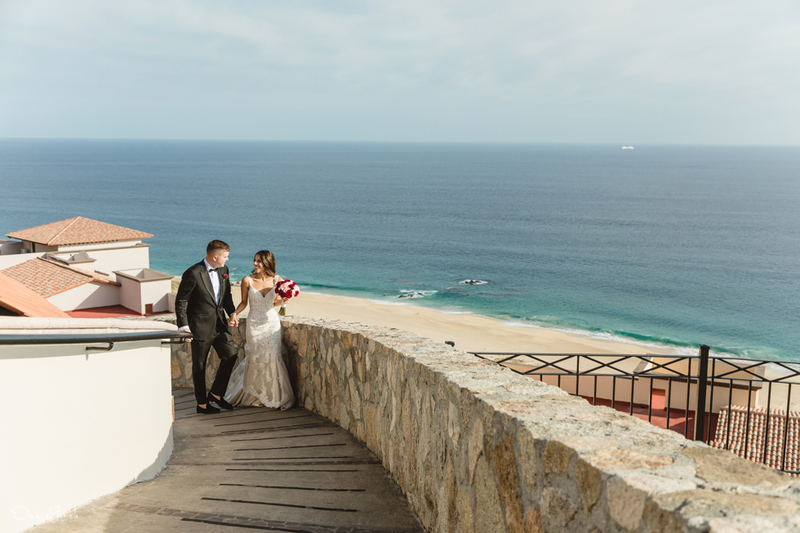 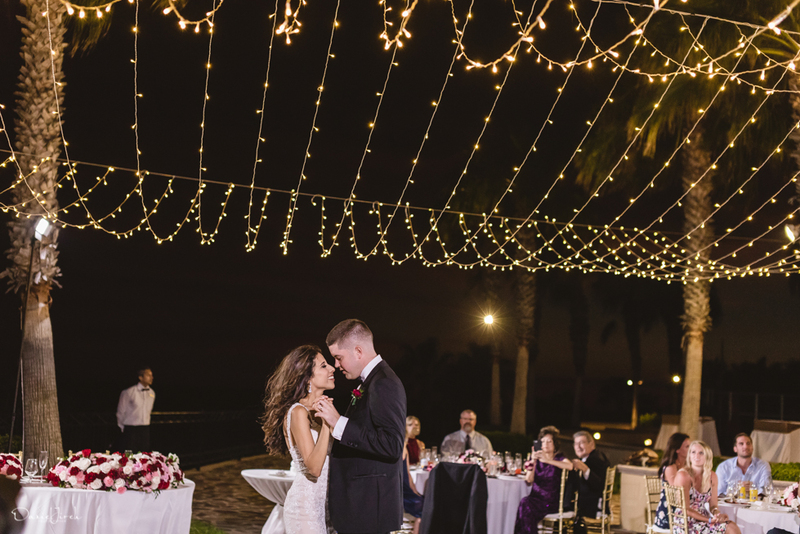 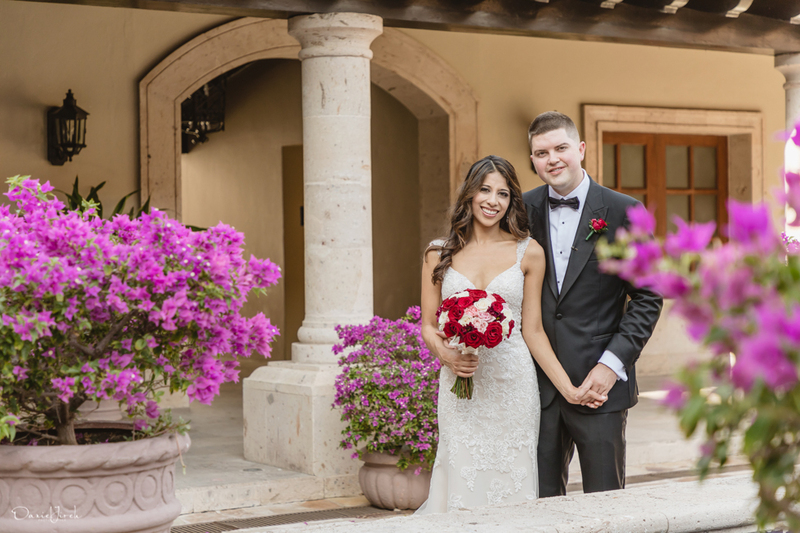 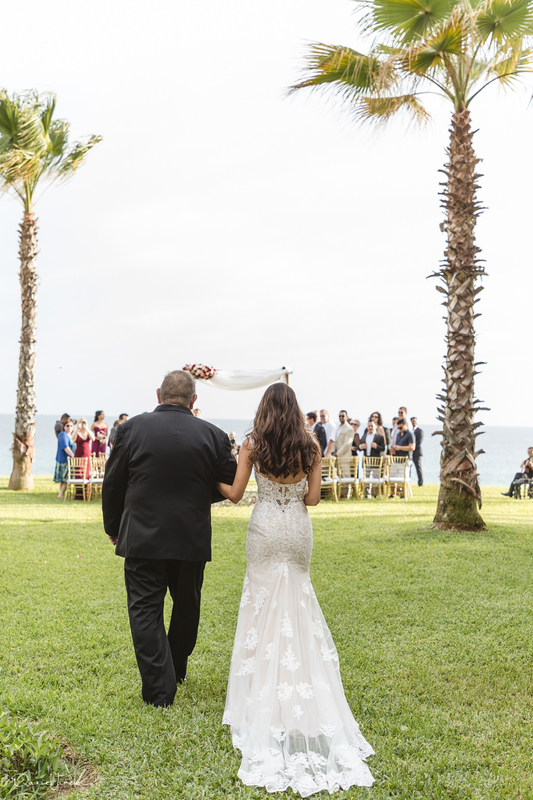 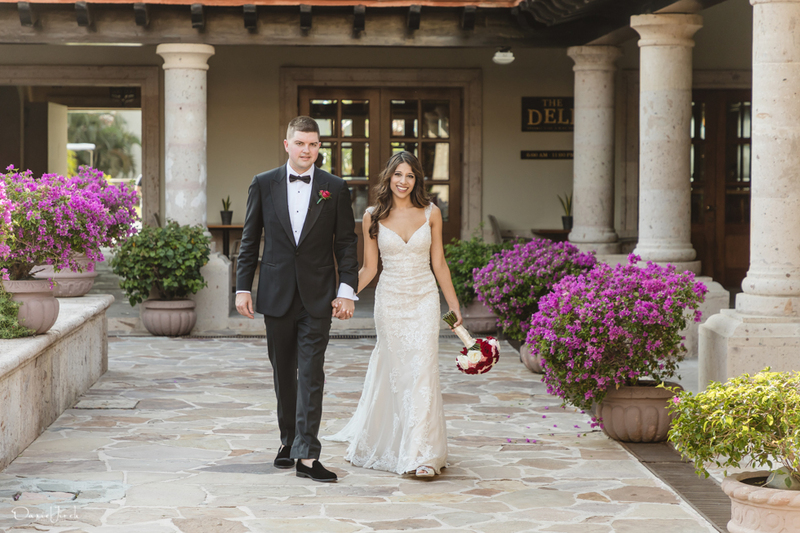 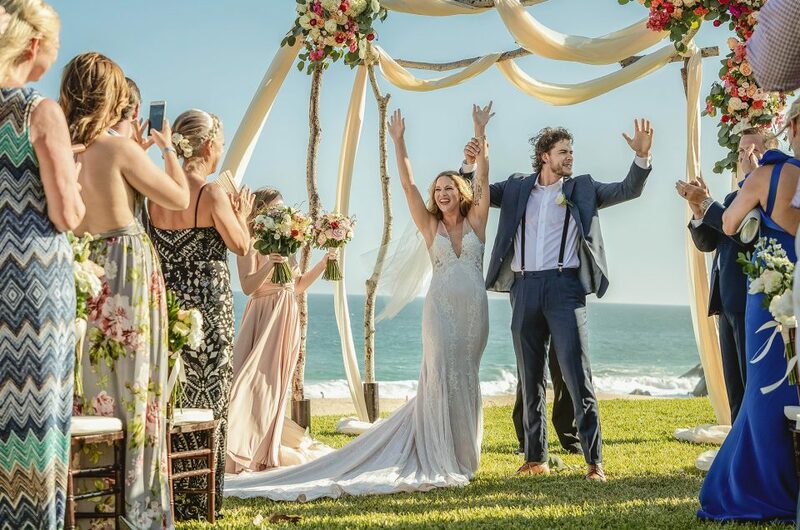 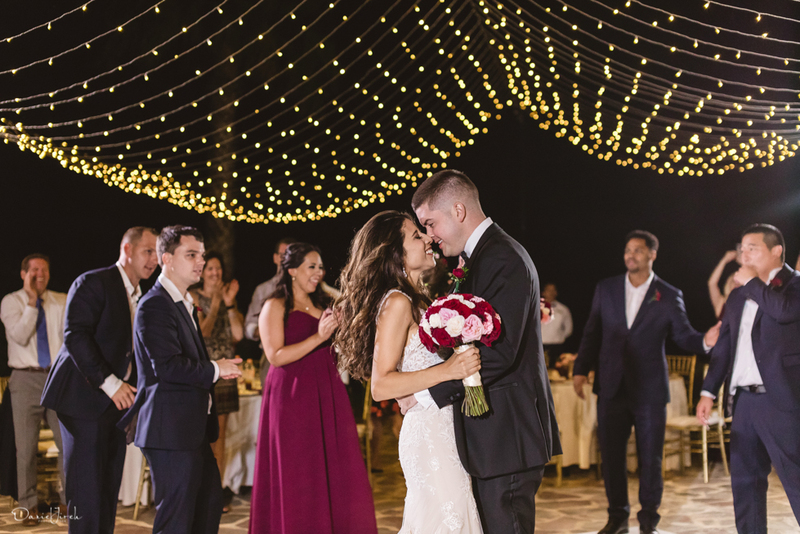 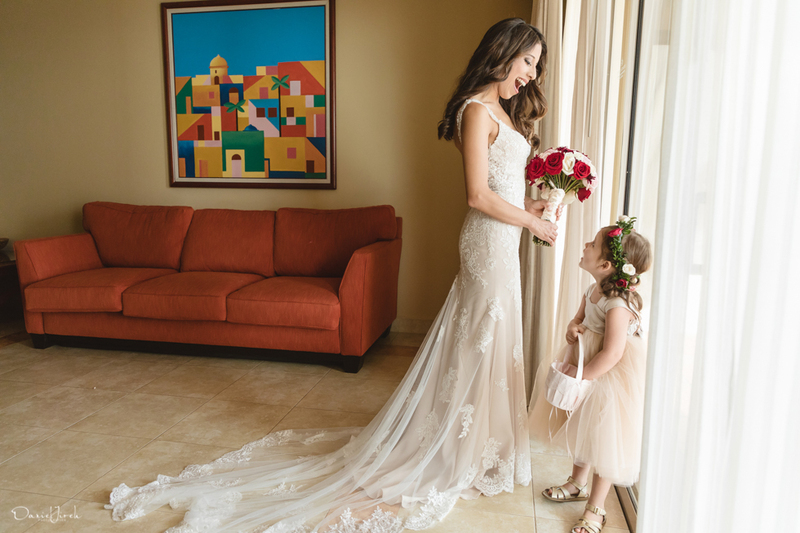 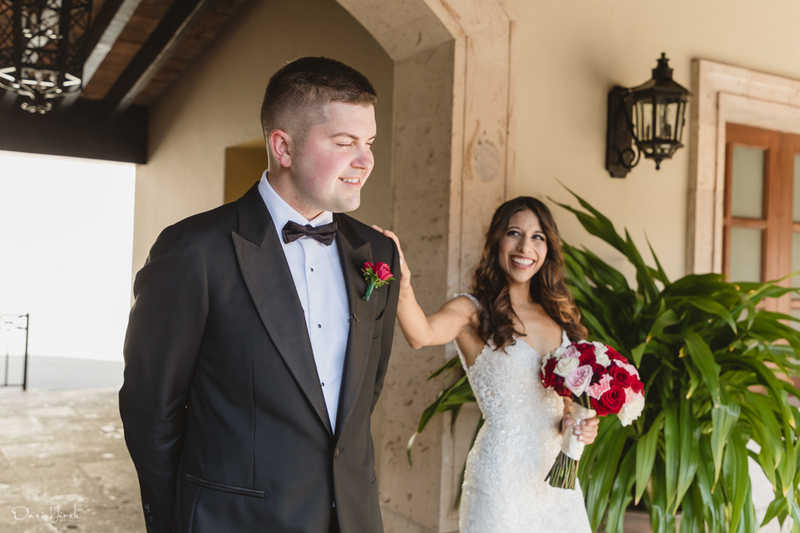 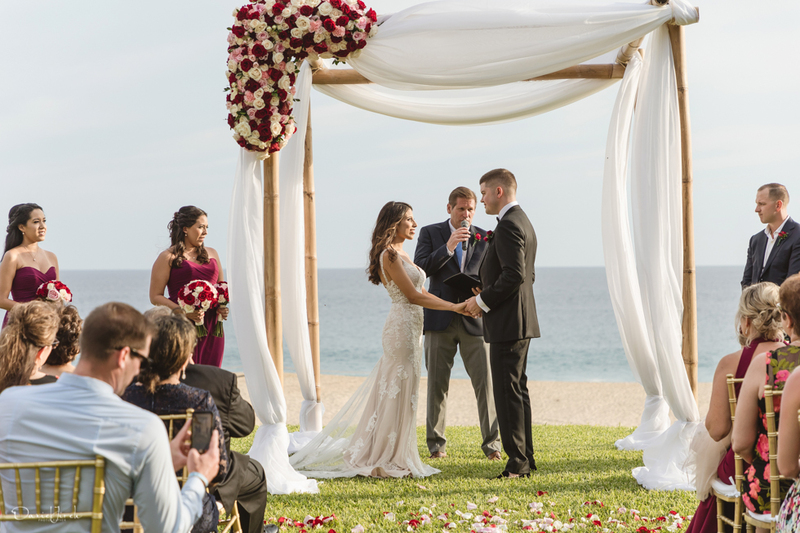 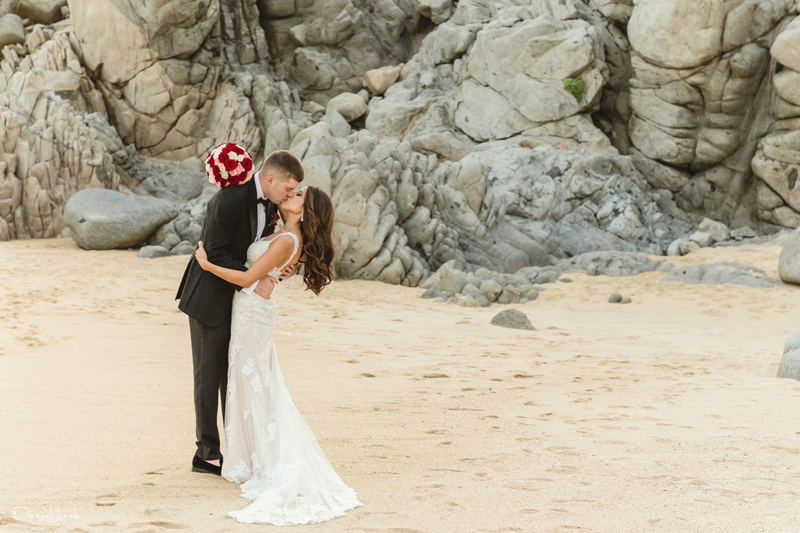 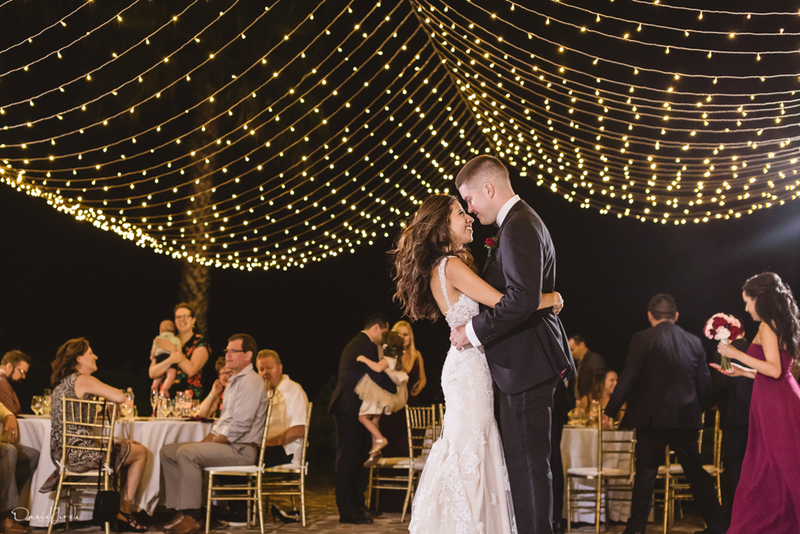 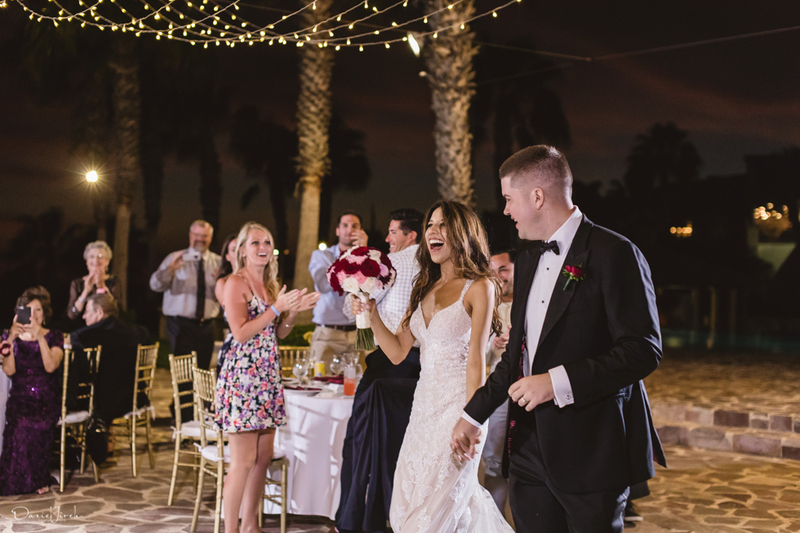 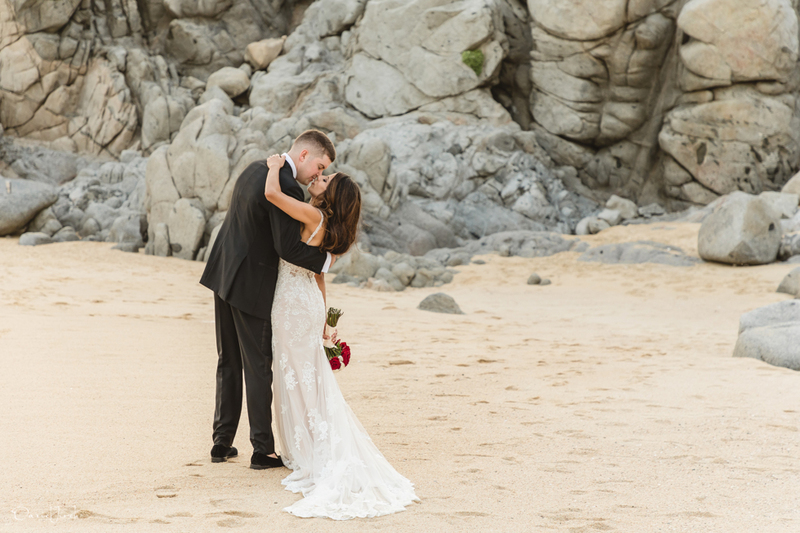 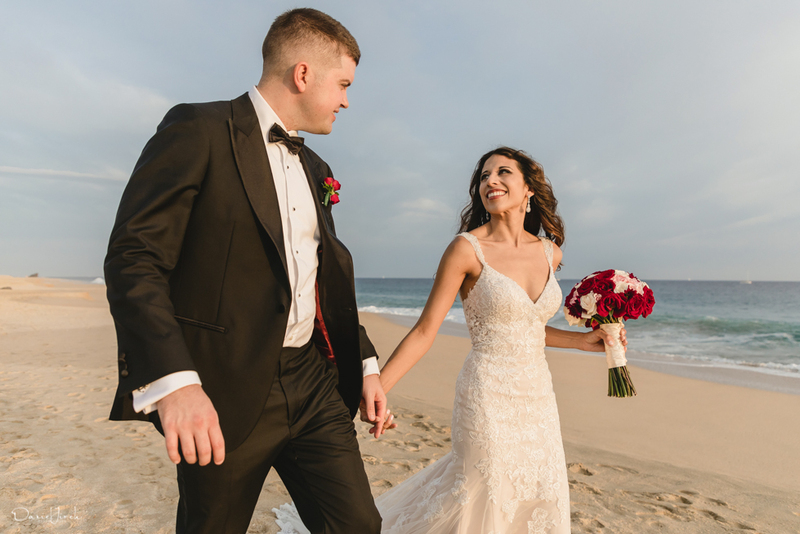 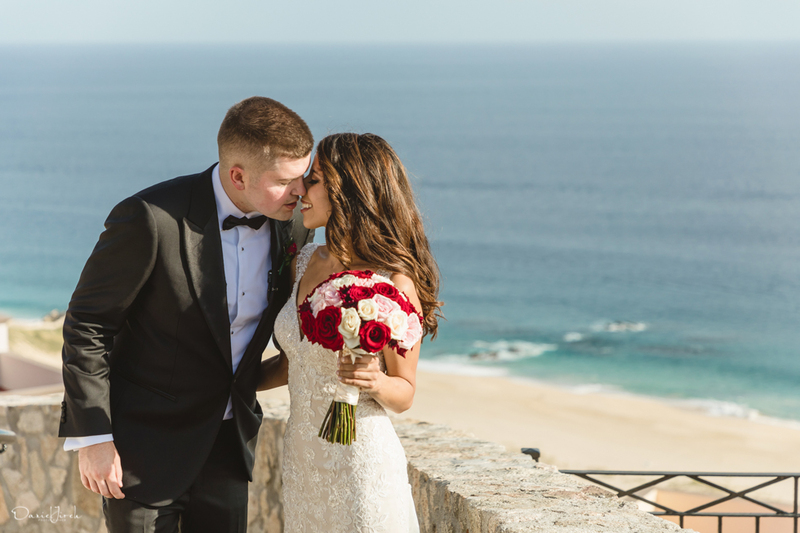 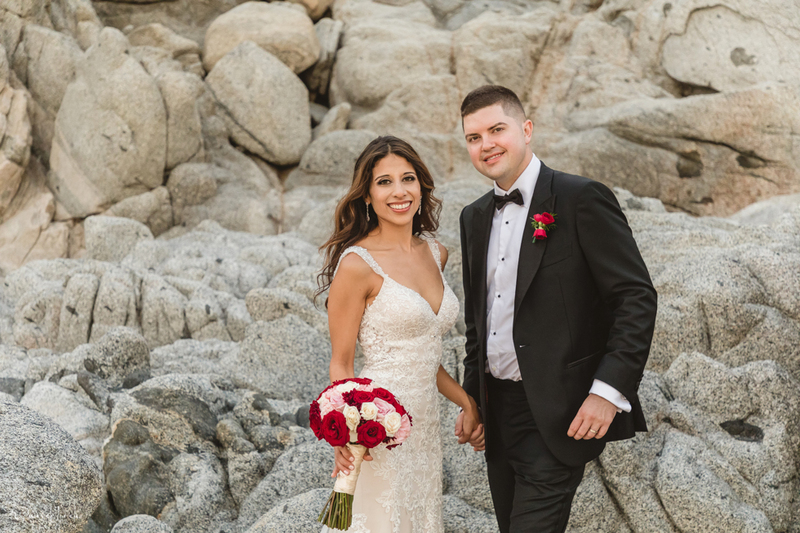 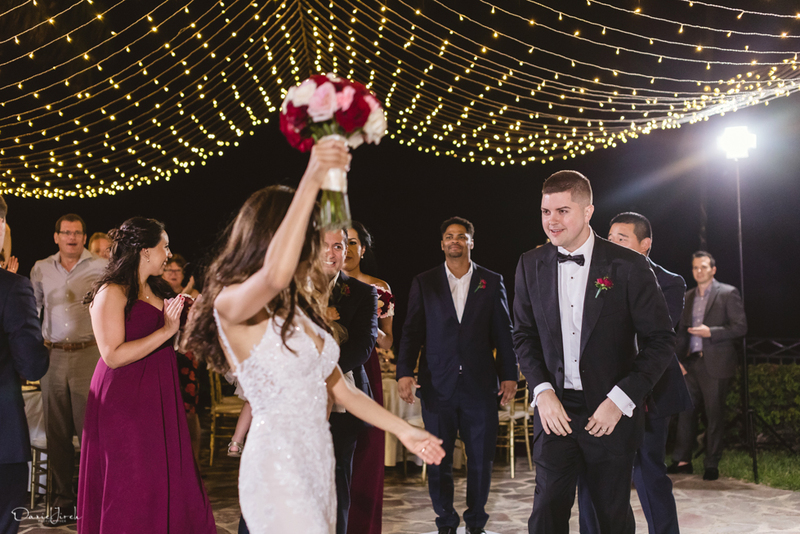 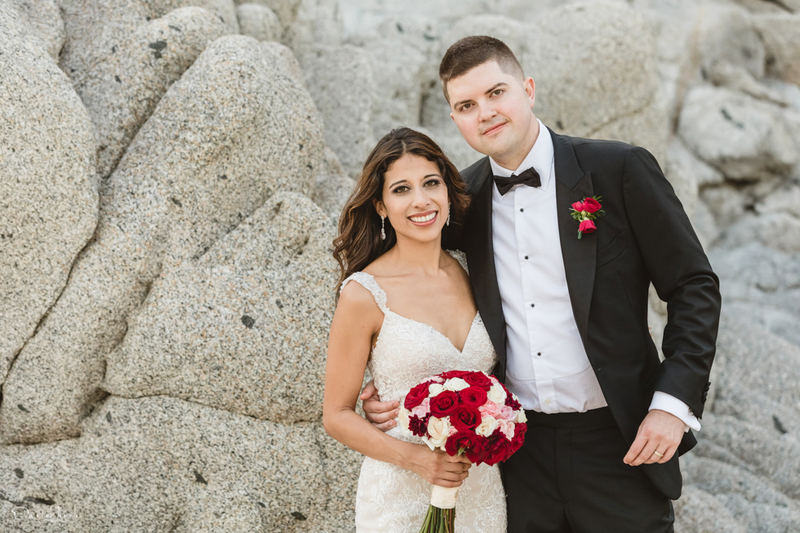 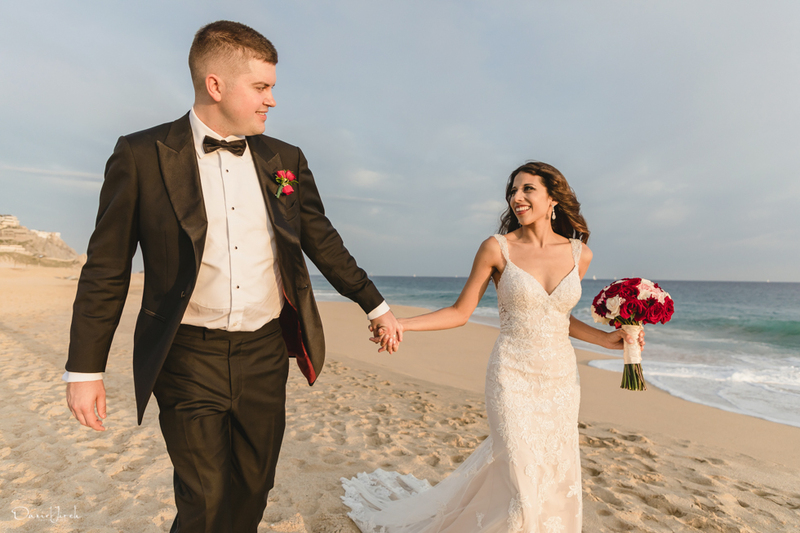 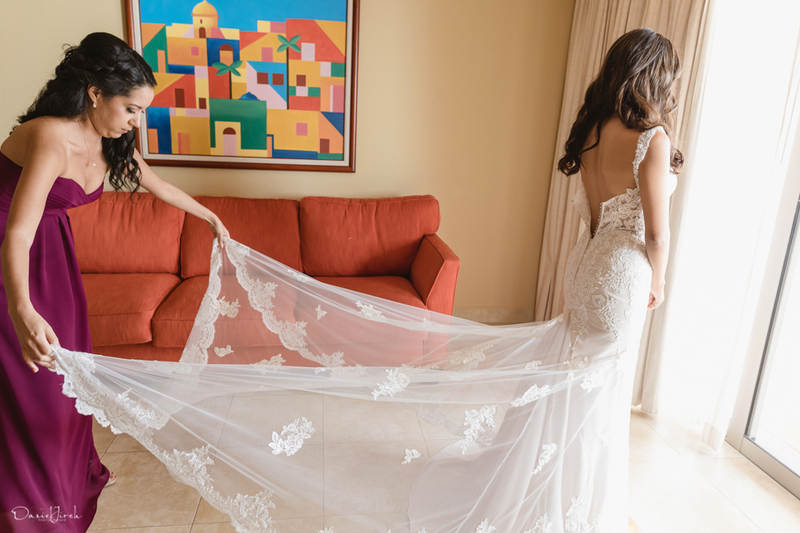 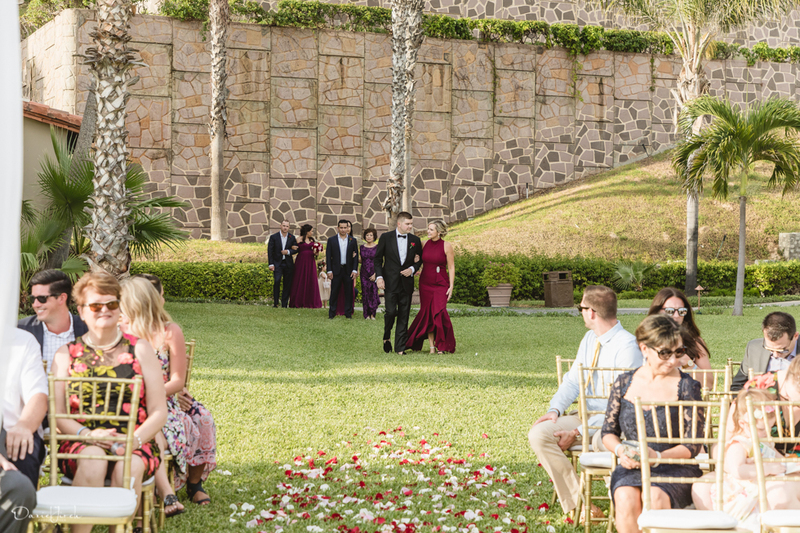 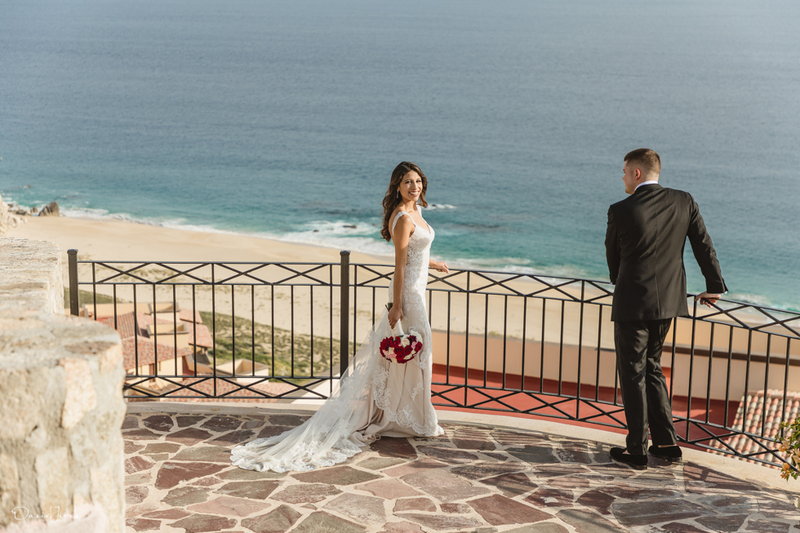 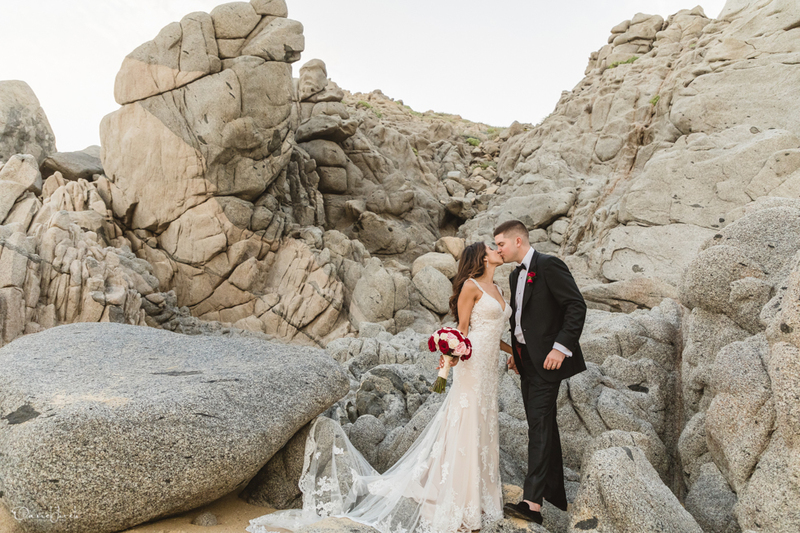 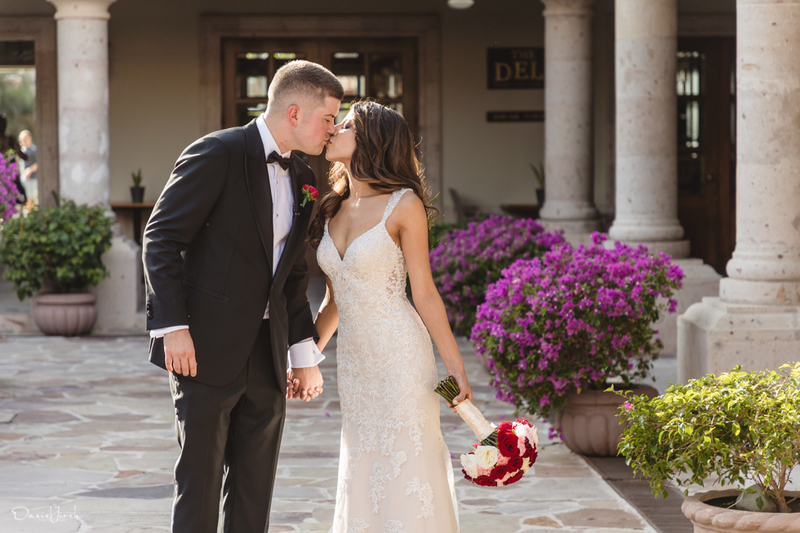 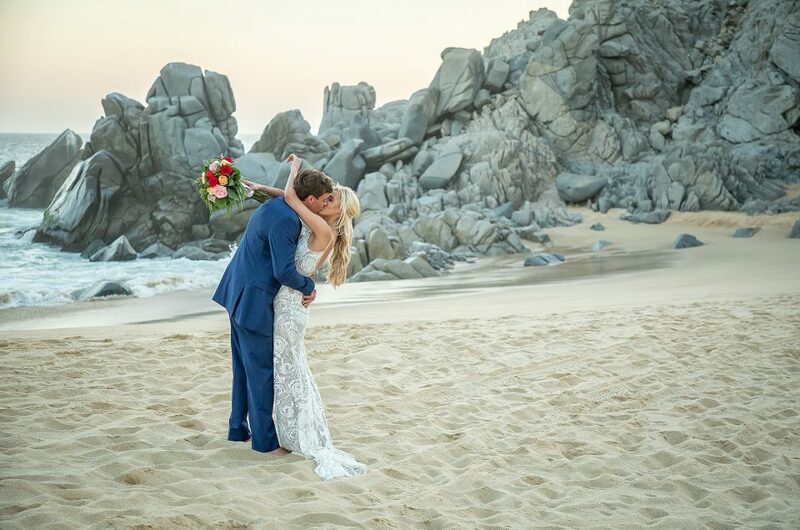 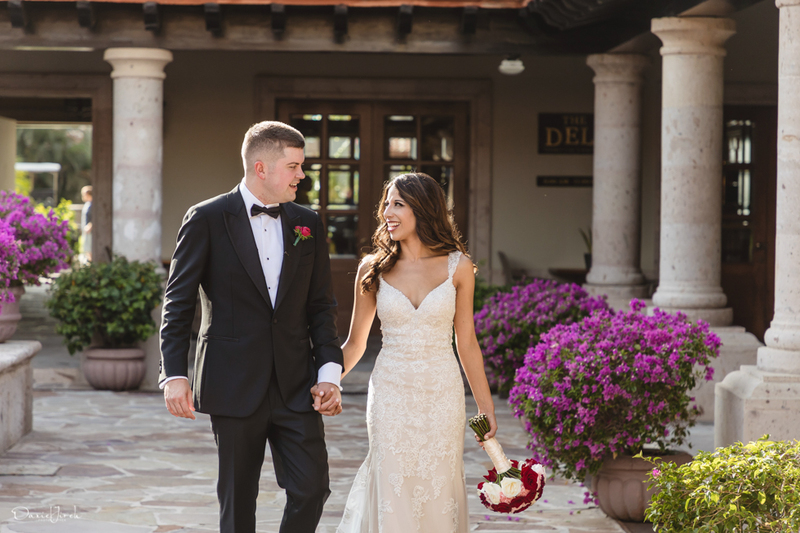 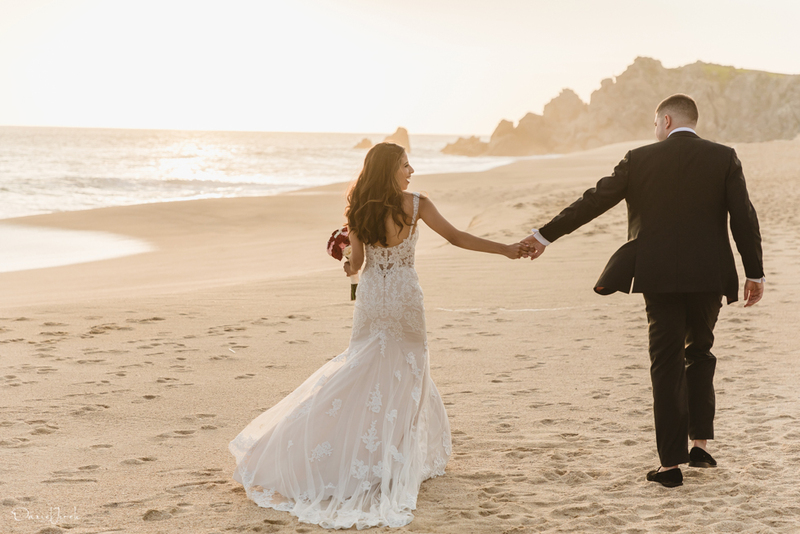 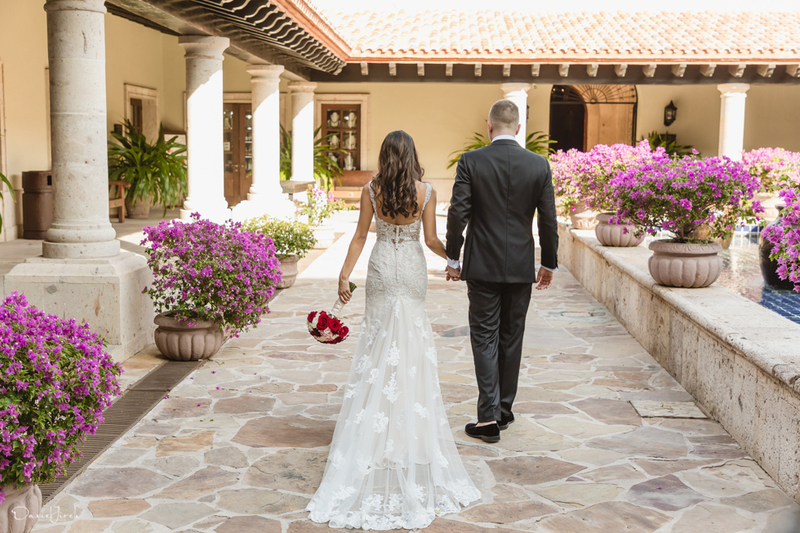 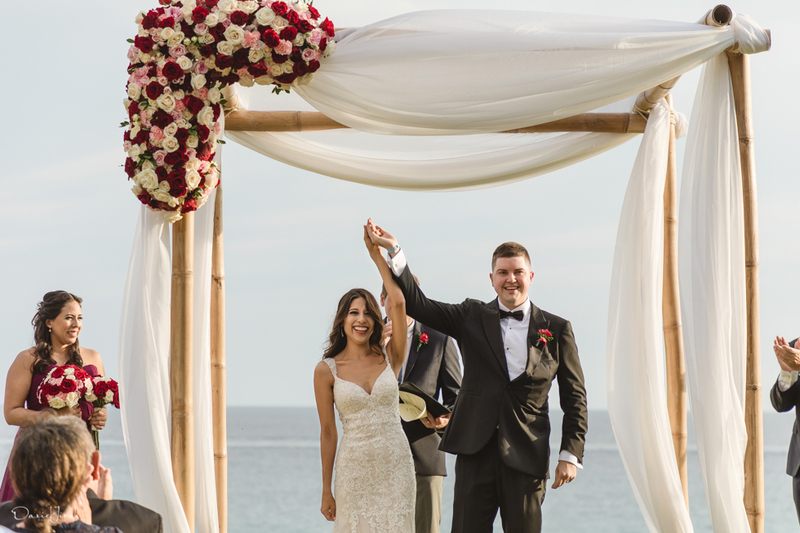 Juxtaposed with Pueblo Bonito’s towering palm trees, the Cabo skyline provided the perfect backdrop to showcase Jennifer’s form fitting, mermaid style lace gown and natural beach waves, as well as Cody’s tailor made black suit and bow tie. 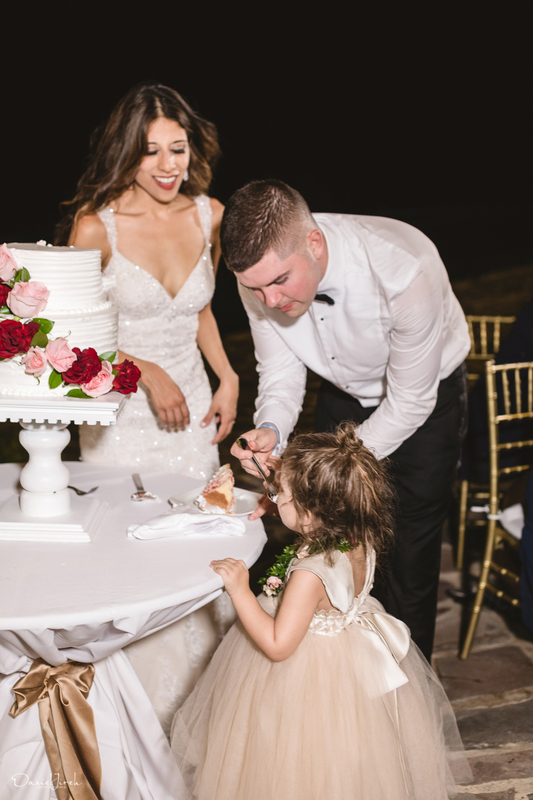 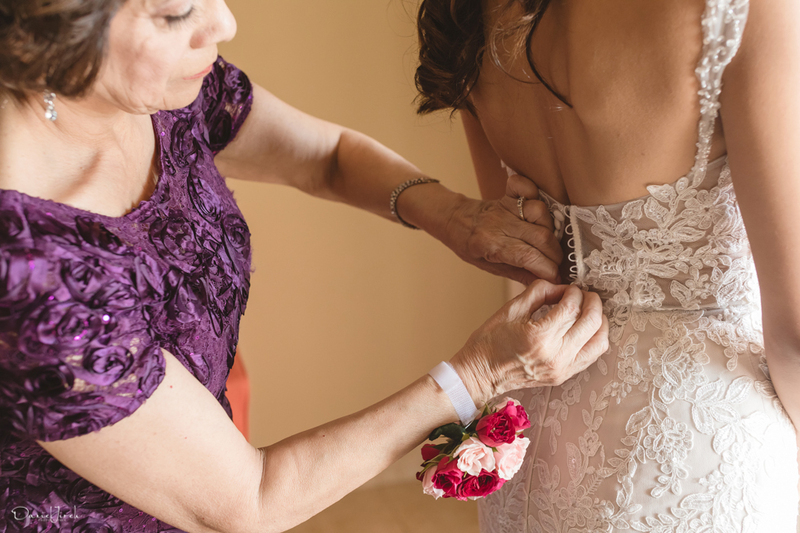 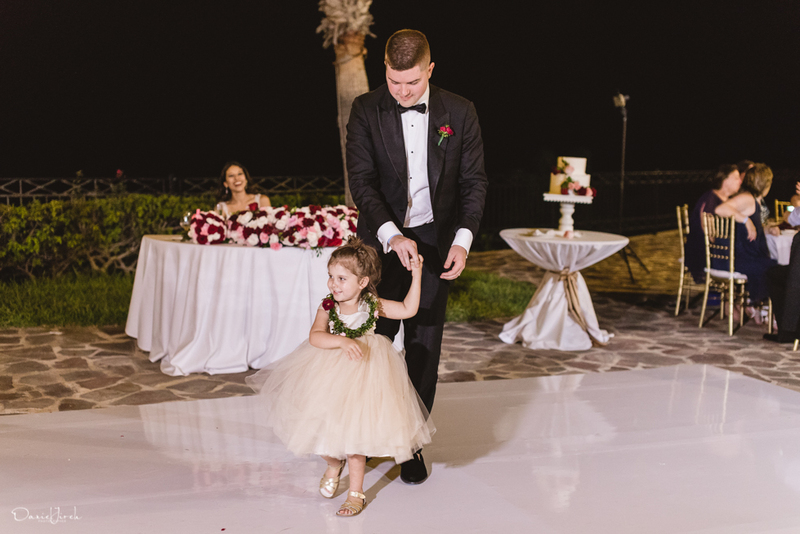 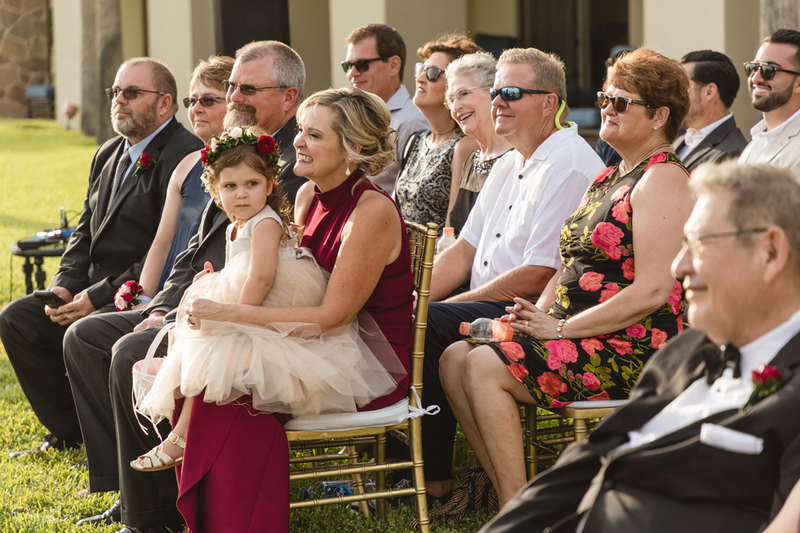 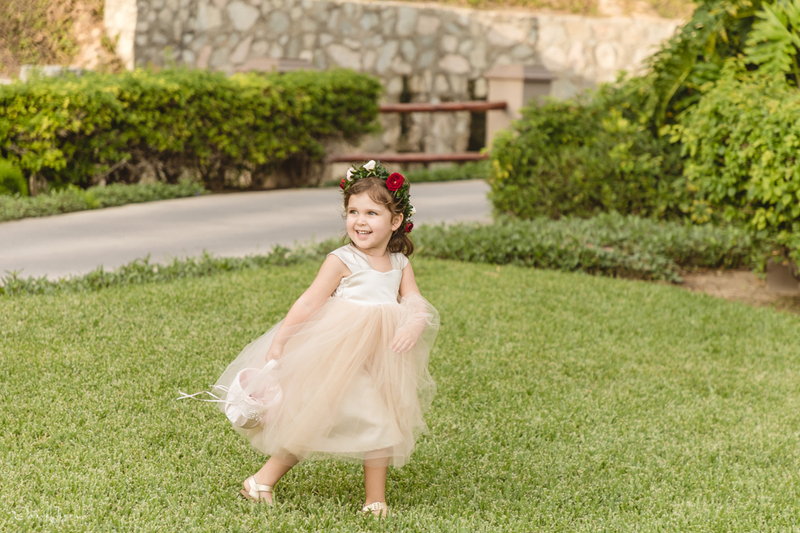 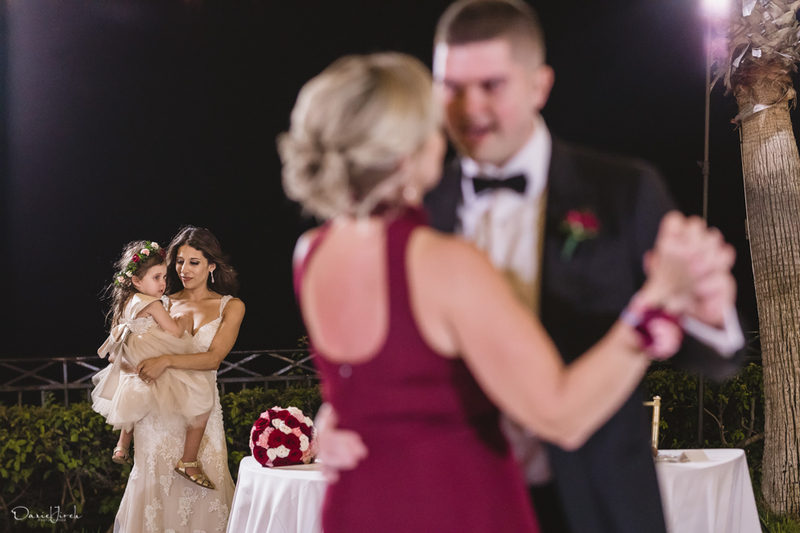 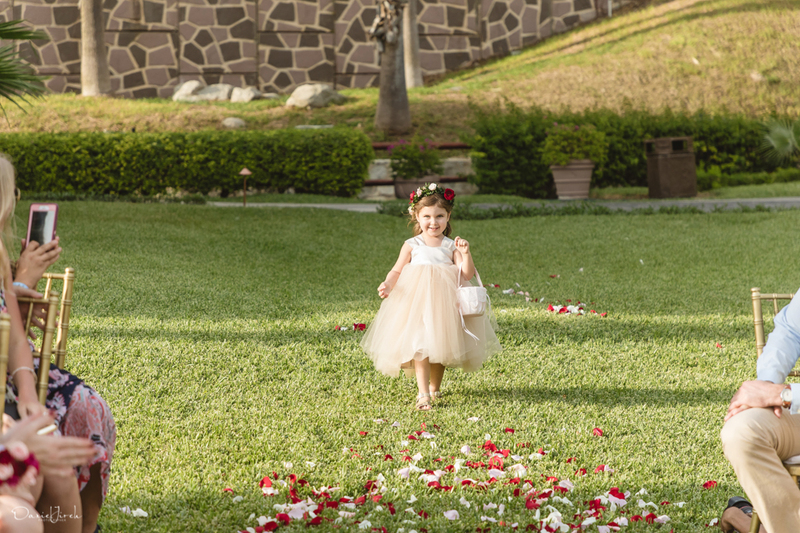 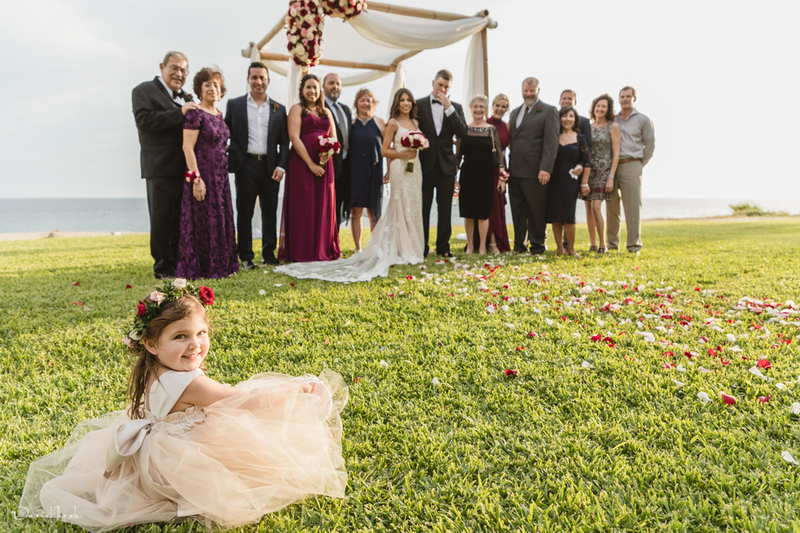 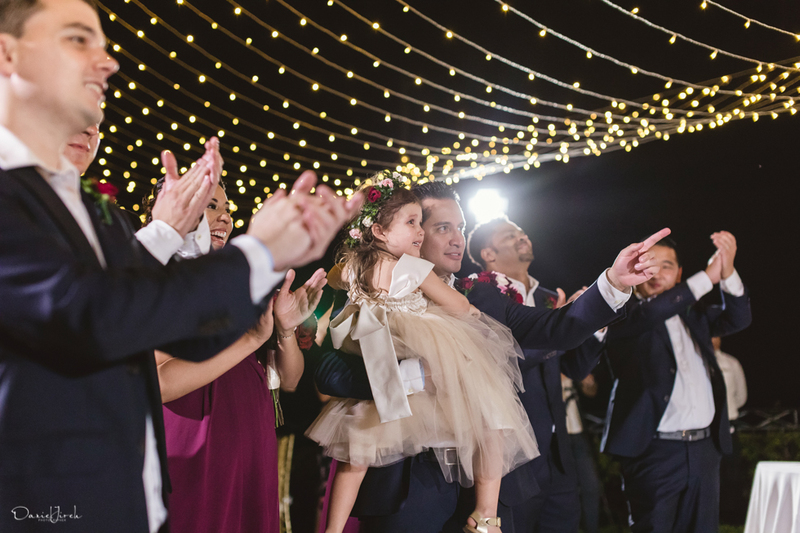 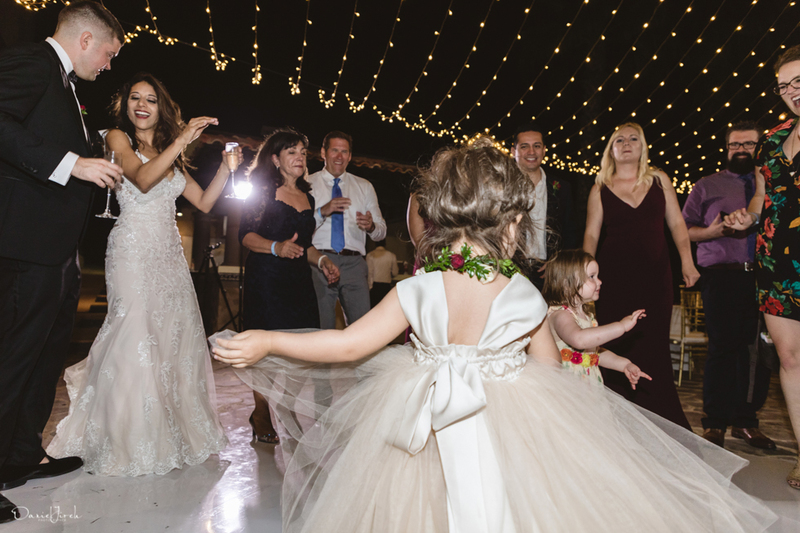 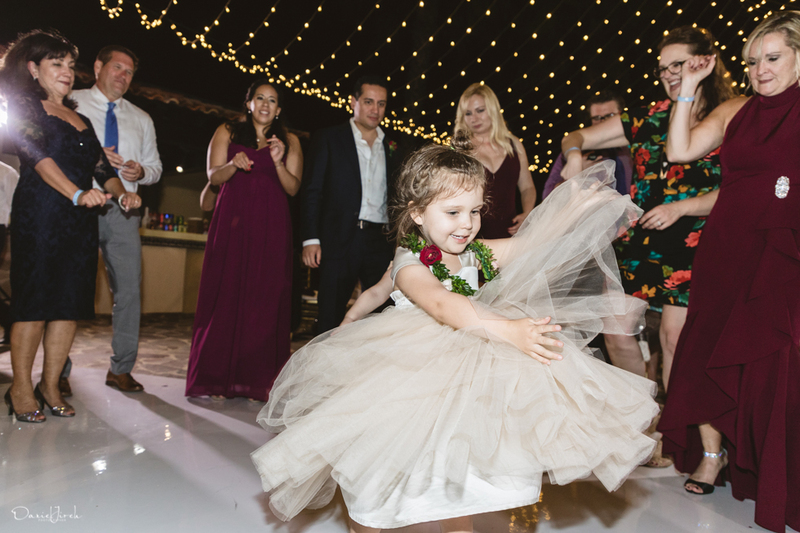 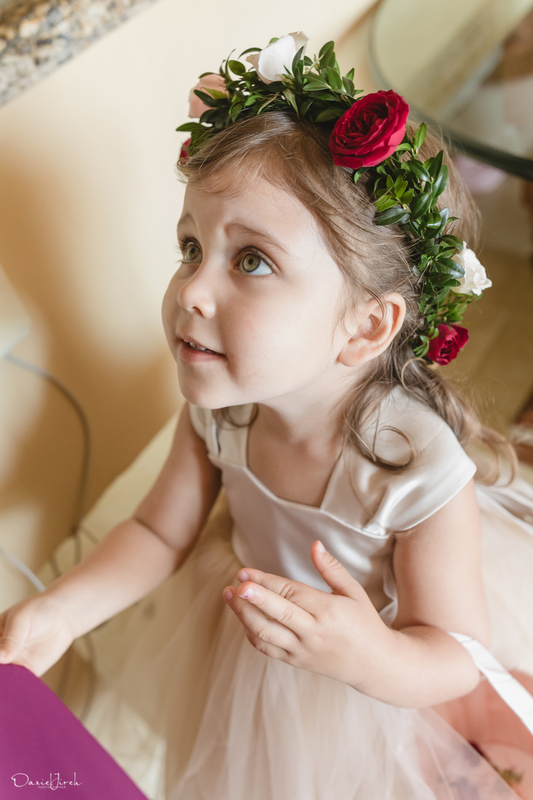 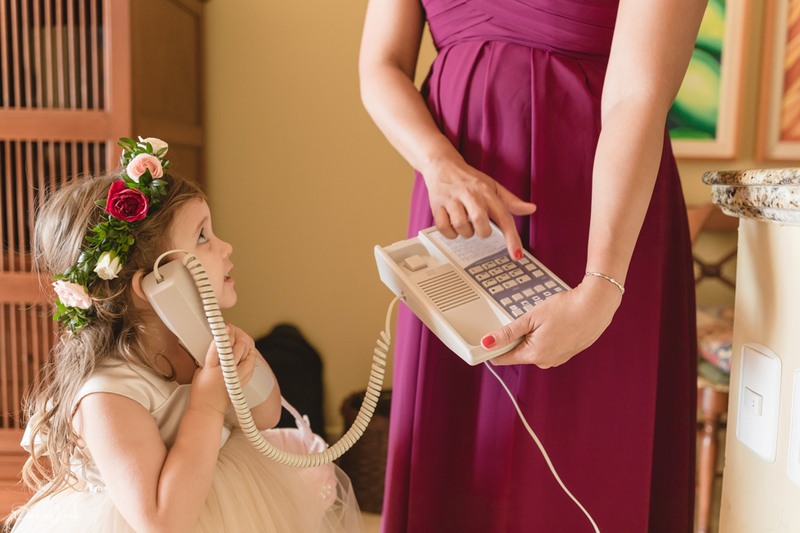 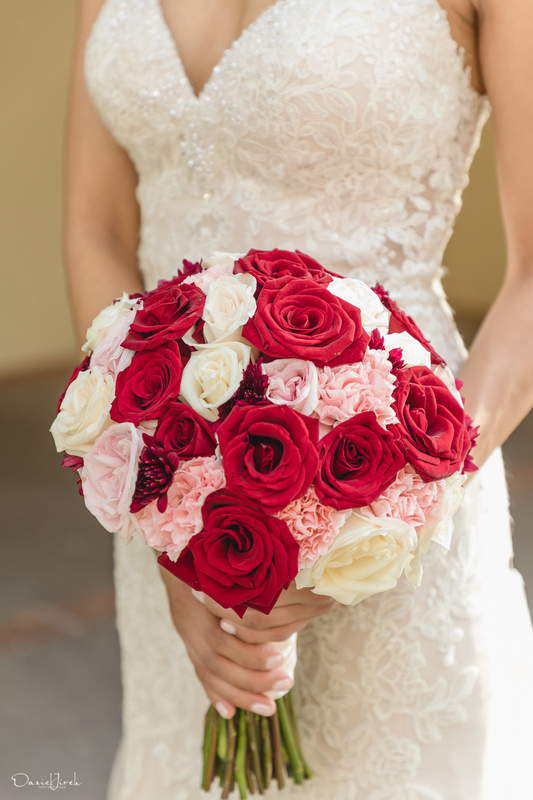 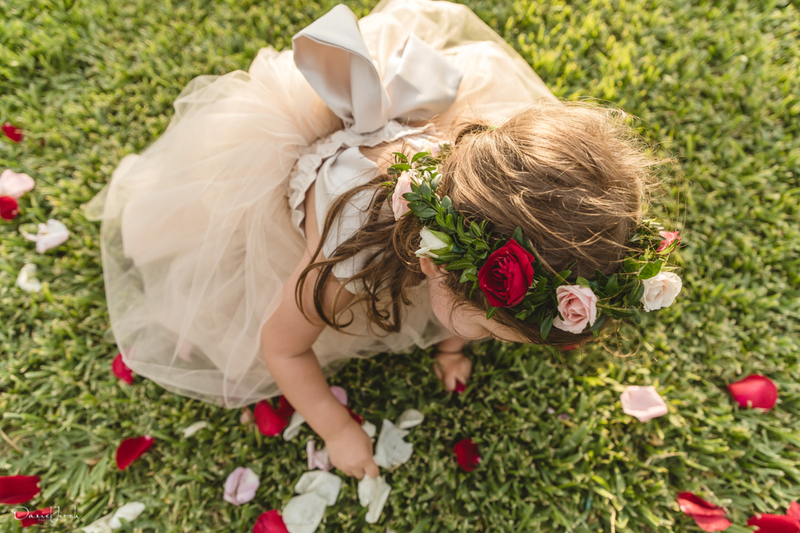 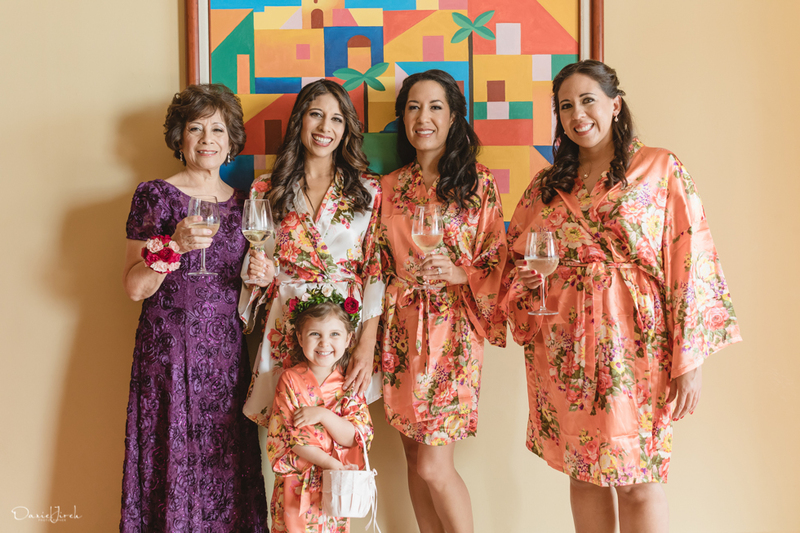 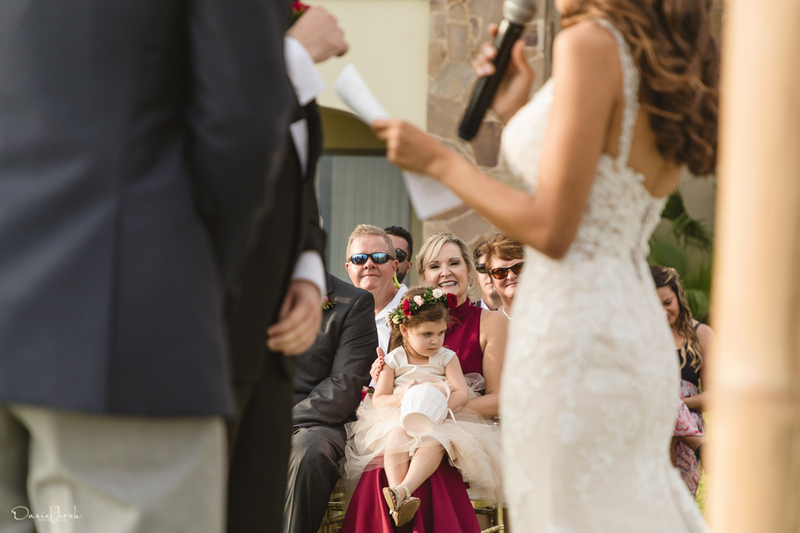 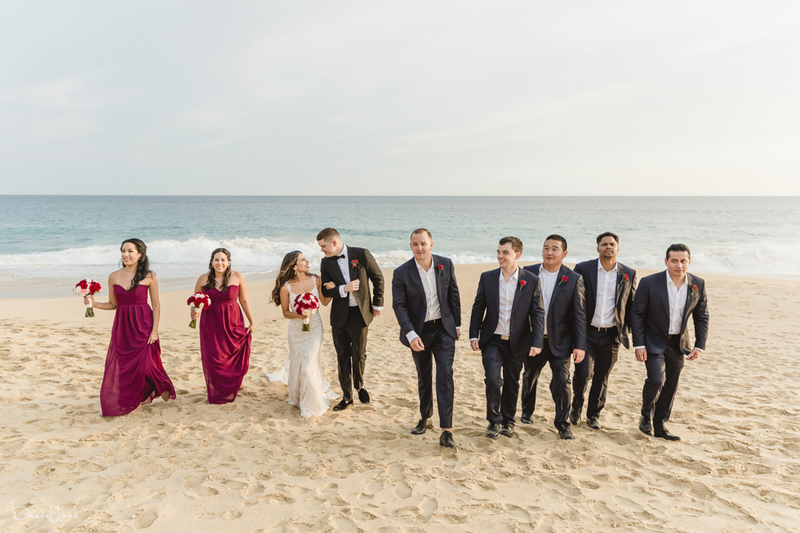 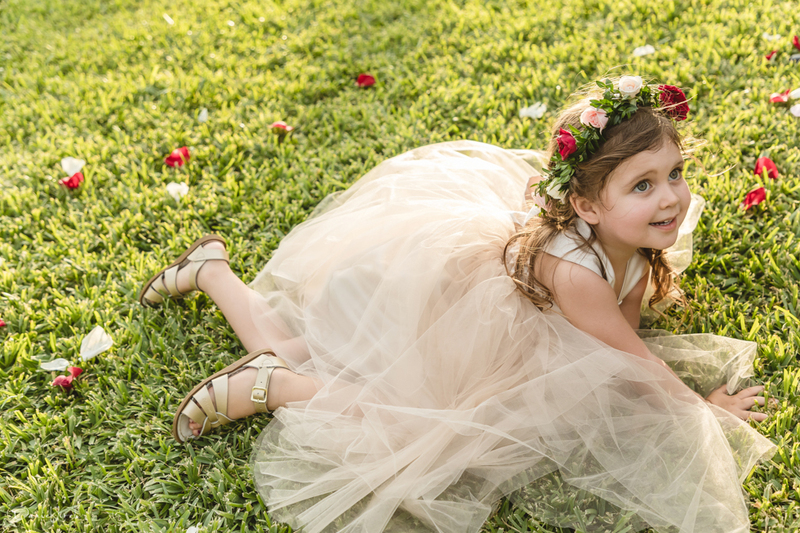 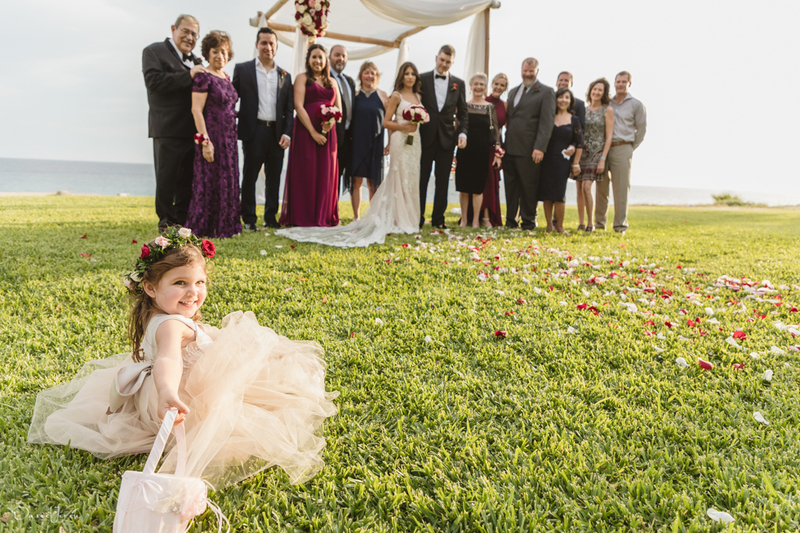 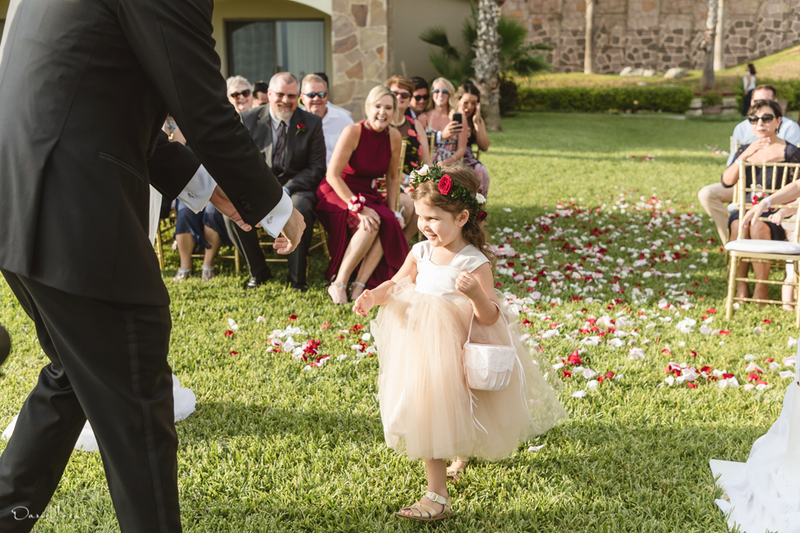 Not to be left behind, our couple’s bridal party looked dapper in deep burgundy for the girls and classic black for the boys, and our tiny flower girls would have made Tinkerbell jealous in their tulle skirts and flower crowns. 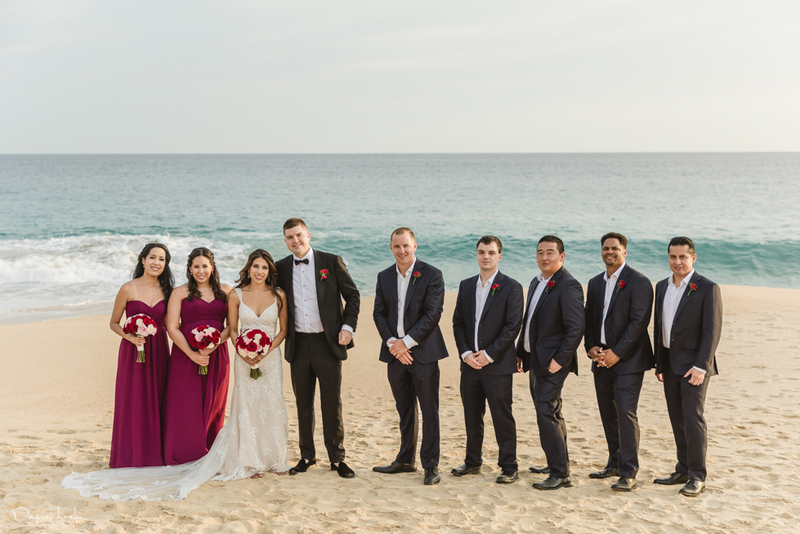 With the formalities signed, sealed and delivered it was time to hit the reception, and what a reception space it was! 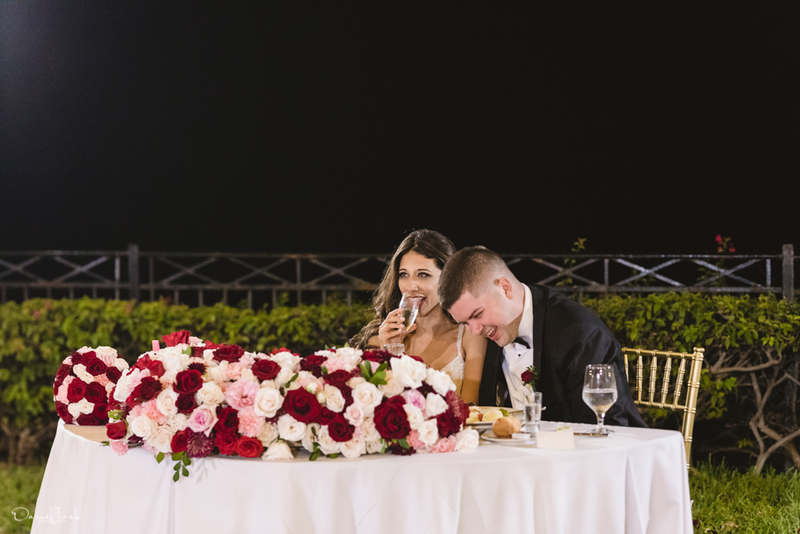 Guests dined beneath a ceiling of twinkling market lights on tablescapes featuring crisp white linens, touches of gold and Jessica’s favorite combination of red, pale pink and cream blossoms. 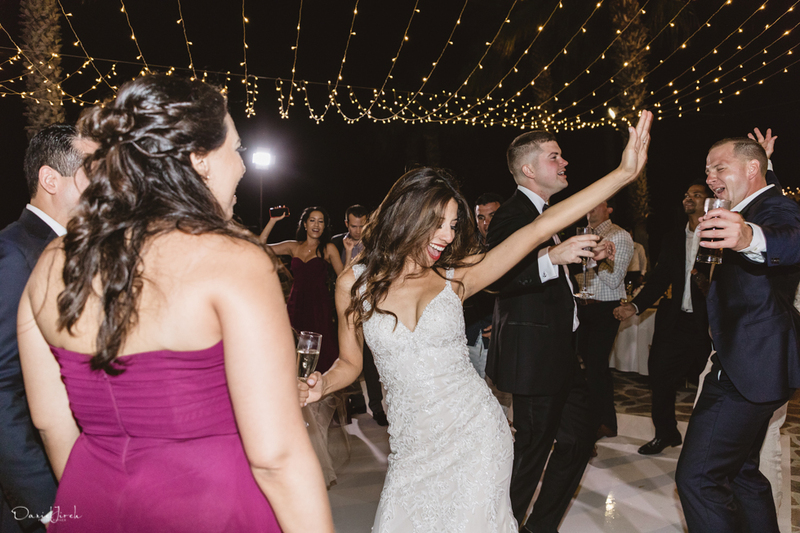 After a scrumptious plated dinner and more than a few cocktails it was time to open that dance floor, and as DJ Alex Alanis pumped up the volume the talented team at Avantec provided a lighting scheme any club owner would be proud of. 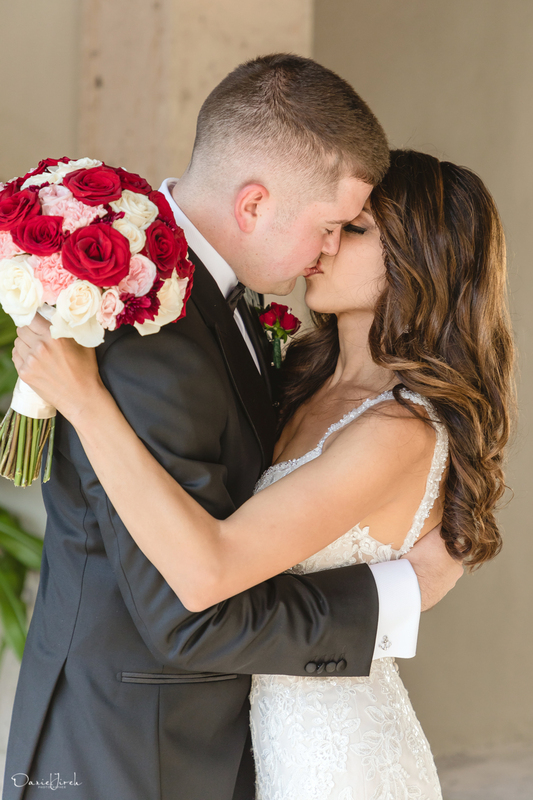 Thank you Jennifer and Cody for sharing your moment with us! 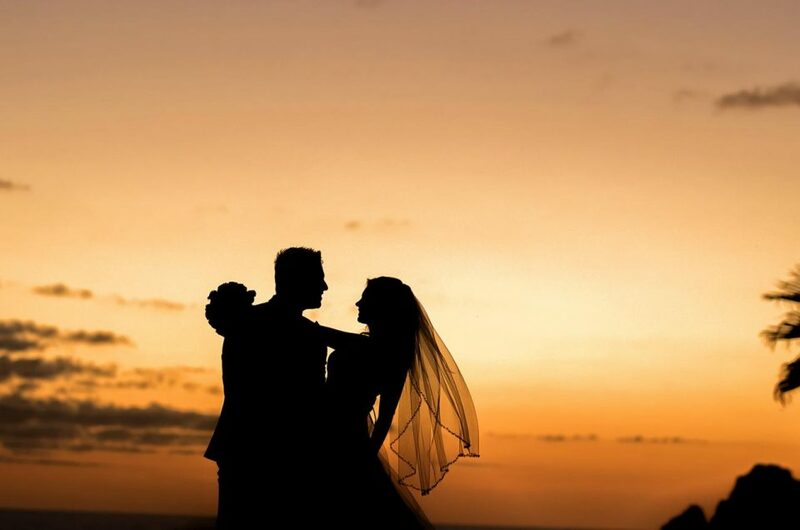 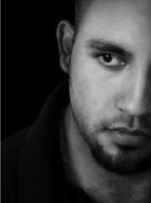 We wish you a long and happy life together and hope to capture all of your milestones in the years to come.